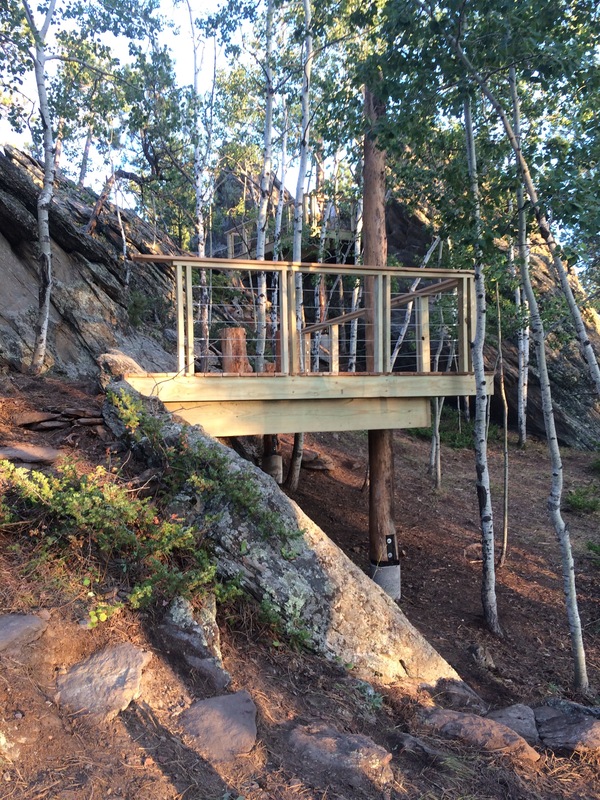 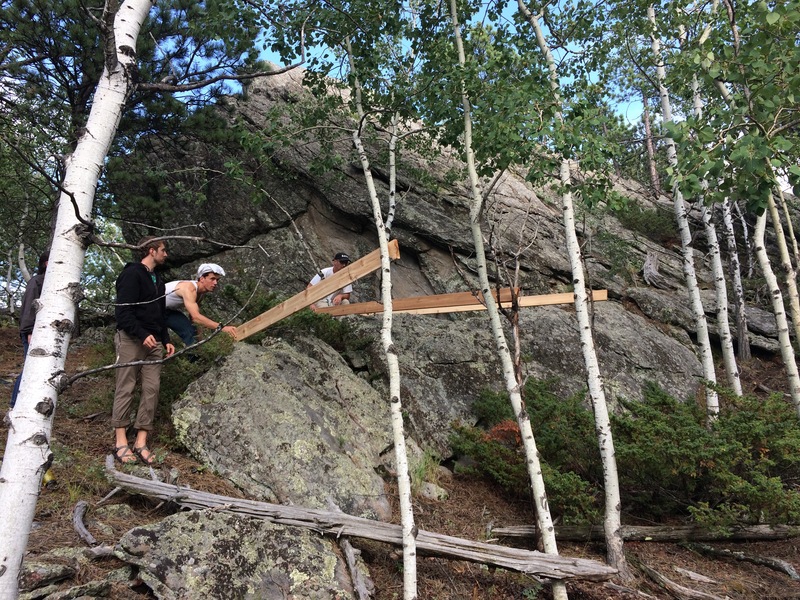 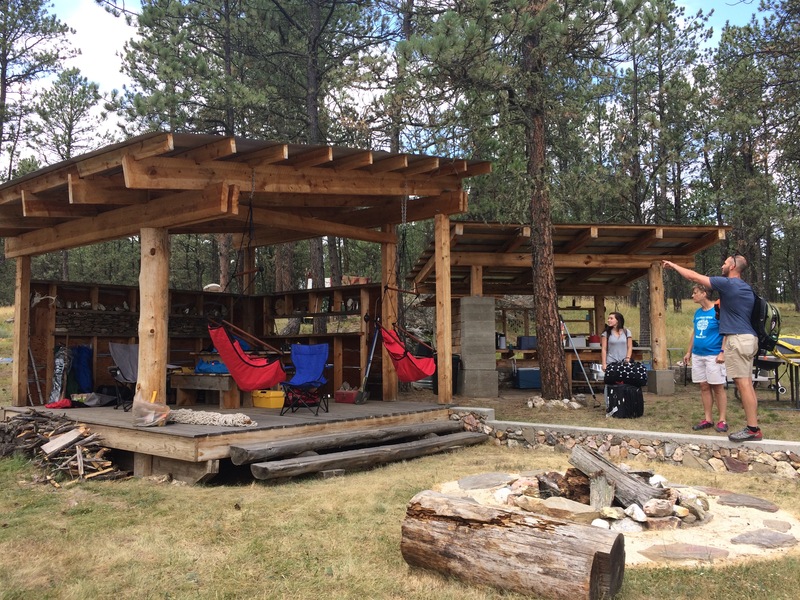 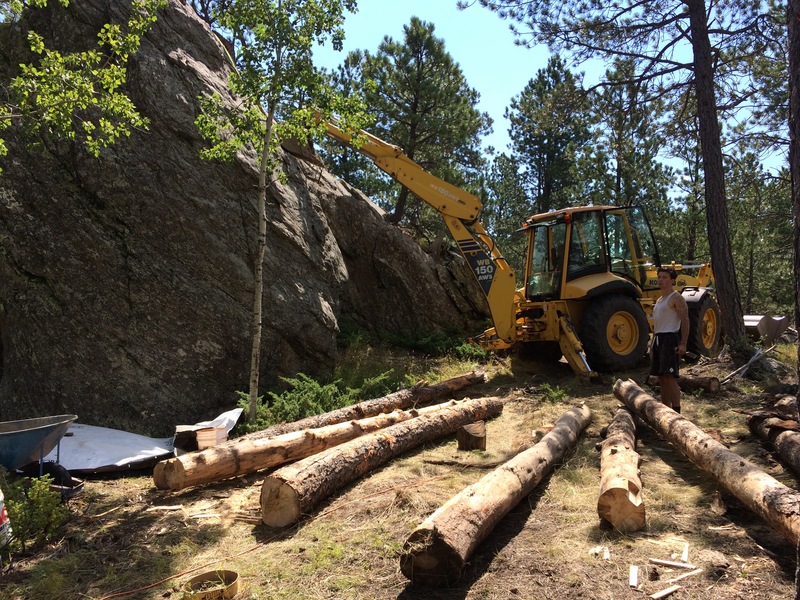 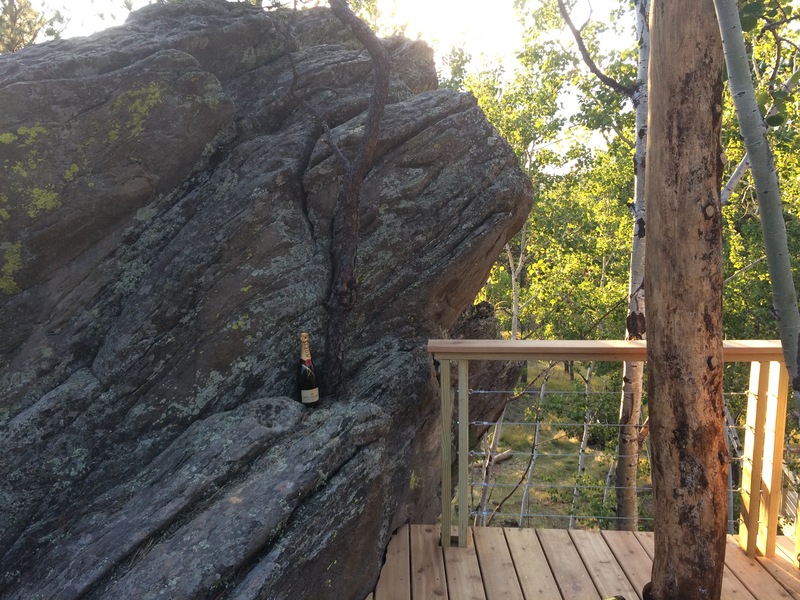 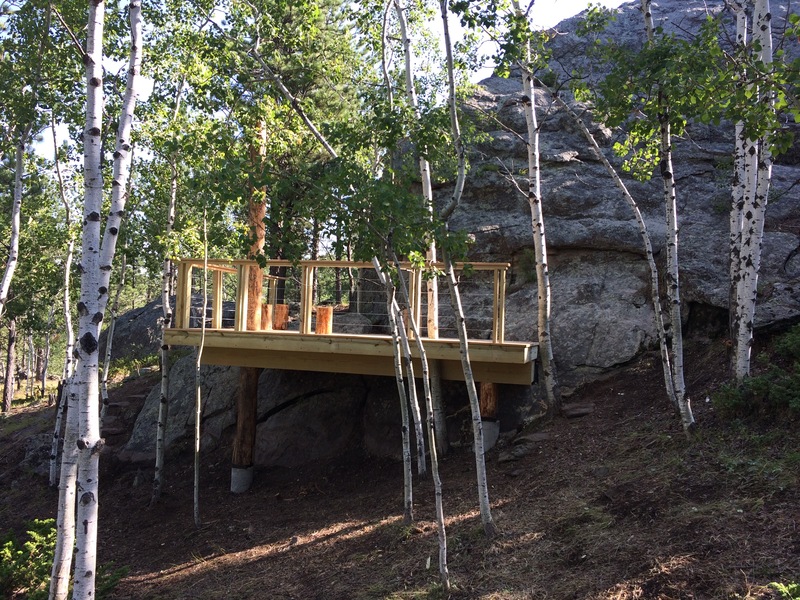 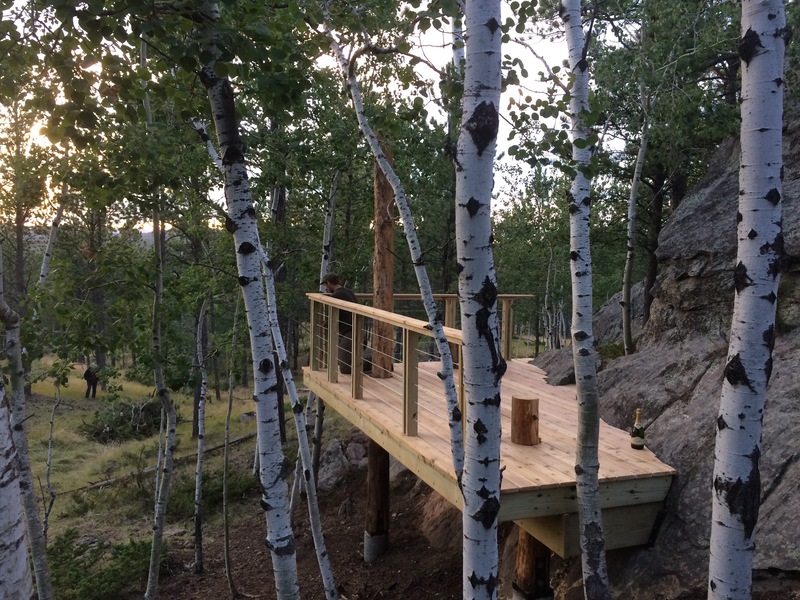 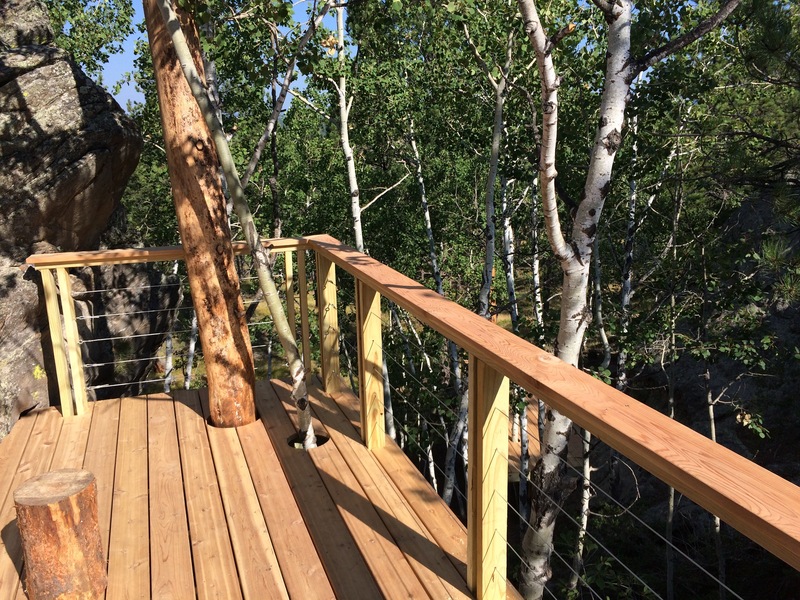 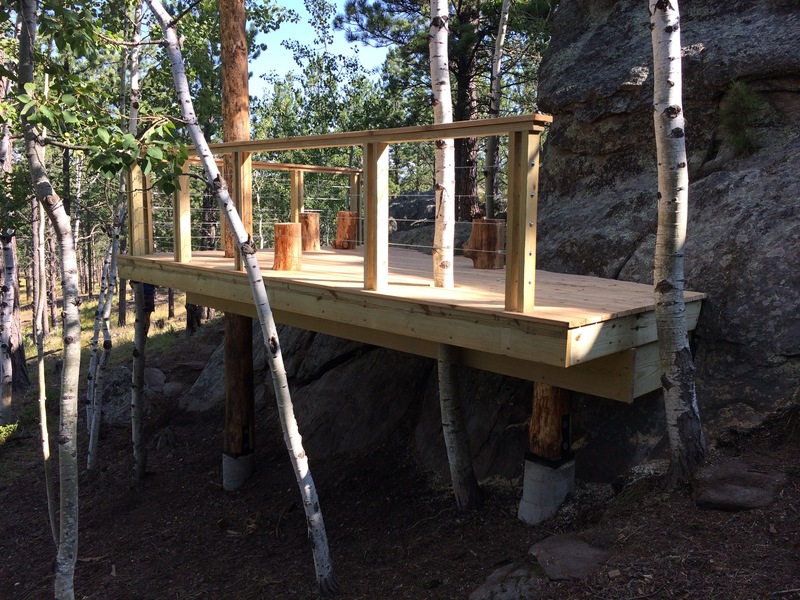 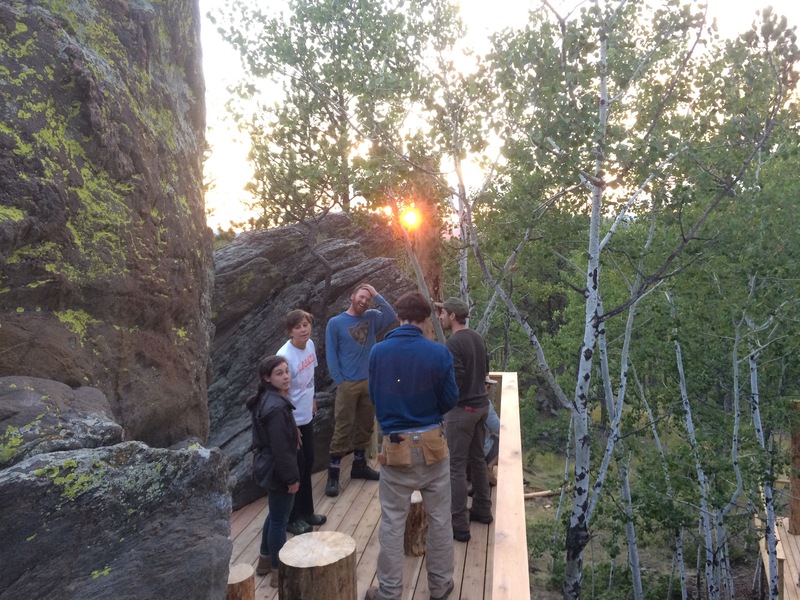 Six years passed between my first RAW Design Build days and this year’s reunion was a great chance to revisit the kitchen/dining structures we built in 2011 and create a new destination on the 1000 acre tree farm outside of Custer, South Dakota. 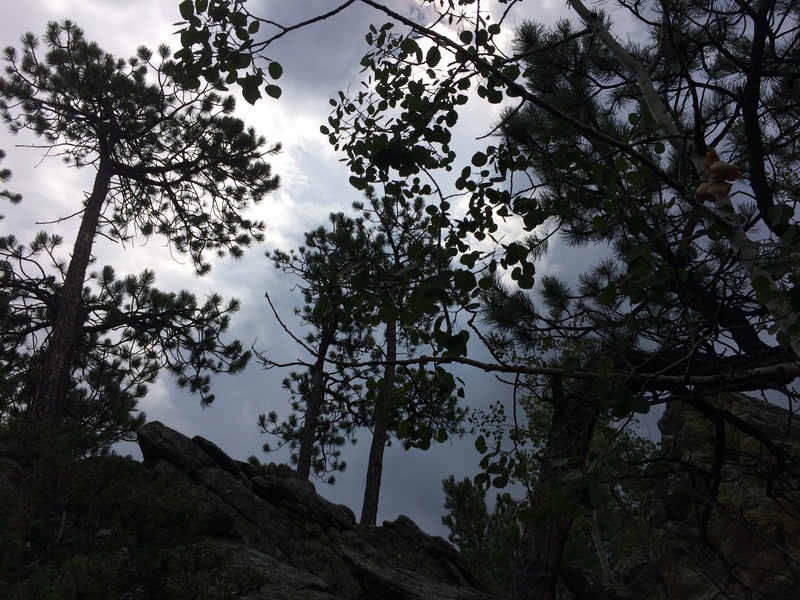 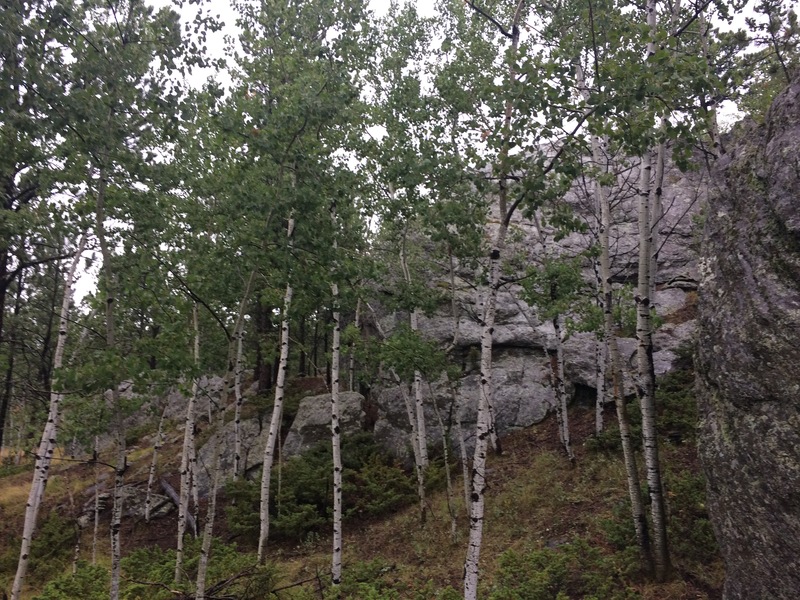 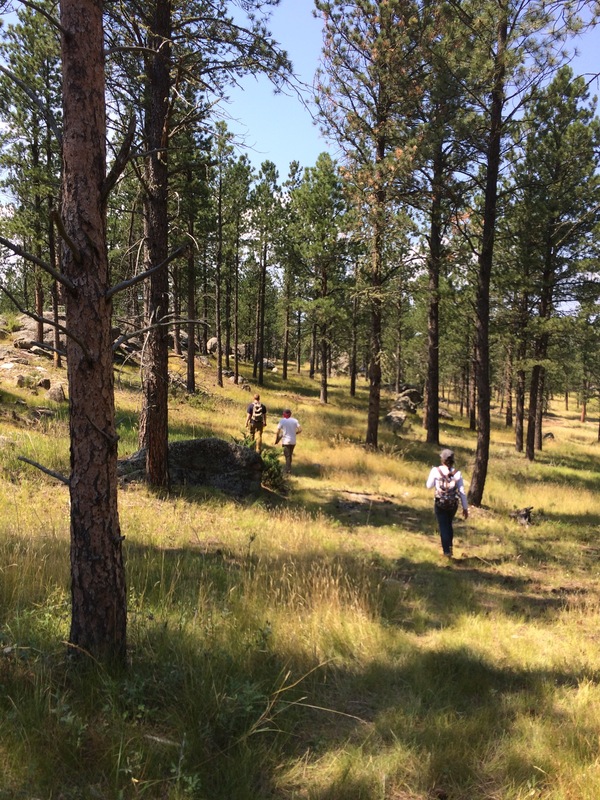 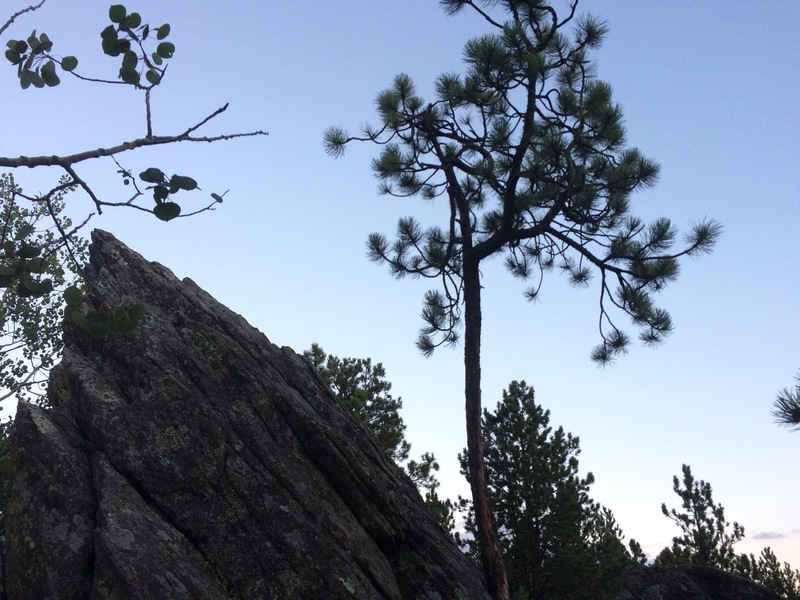 Ponderosa pines dominate the rocky terrain. 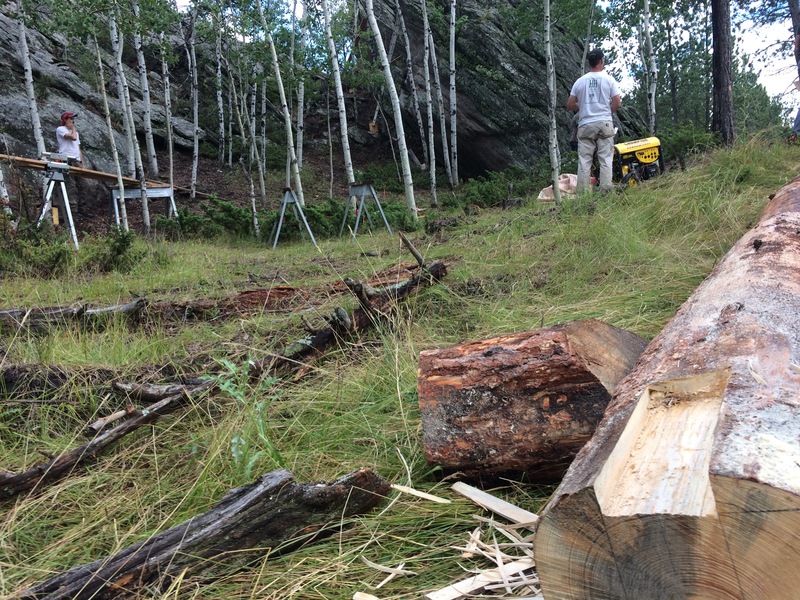 Recently, the pine beetle’s wrath has allowed for new aspen groves to pop up, creating a new food source and habitat for deer and other critters. 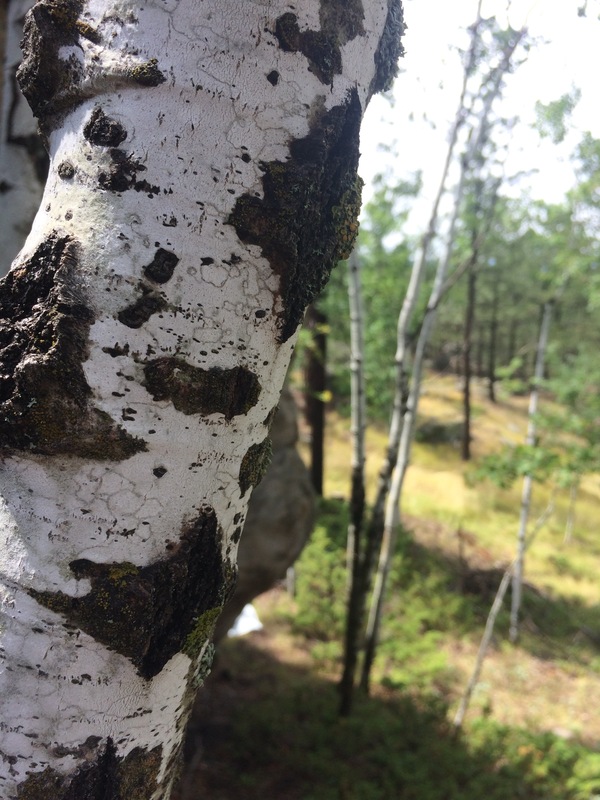 Julie Oswald, the client and owner of the property, said this year has been the year of the Aspen, as she’s been thinking a lot about how it fits into the overall forest management plan. 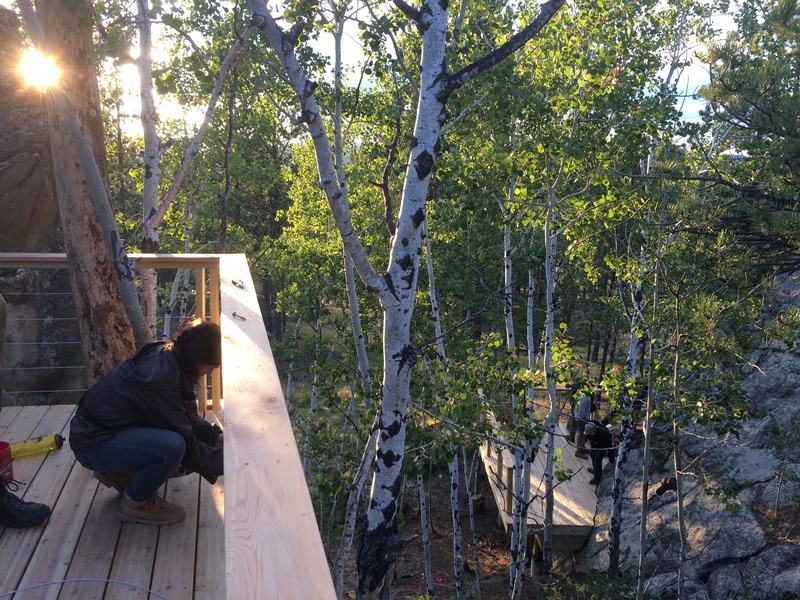 This year’s challenge was to create a place that could change the visitor’s view and perception of the place. 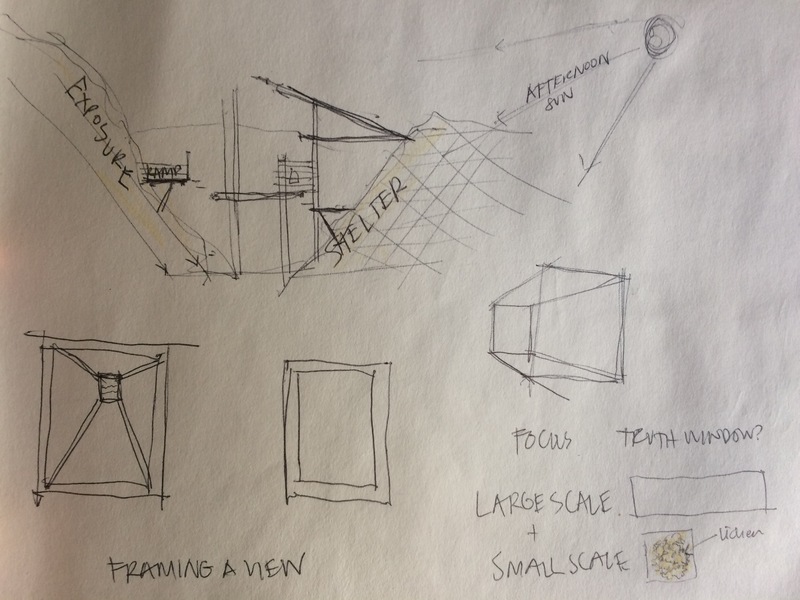 How can we get visitors to look at the site differently? 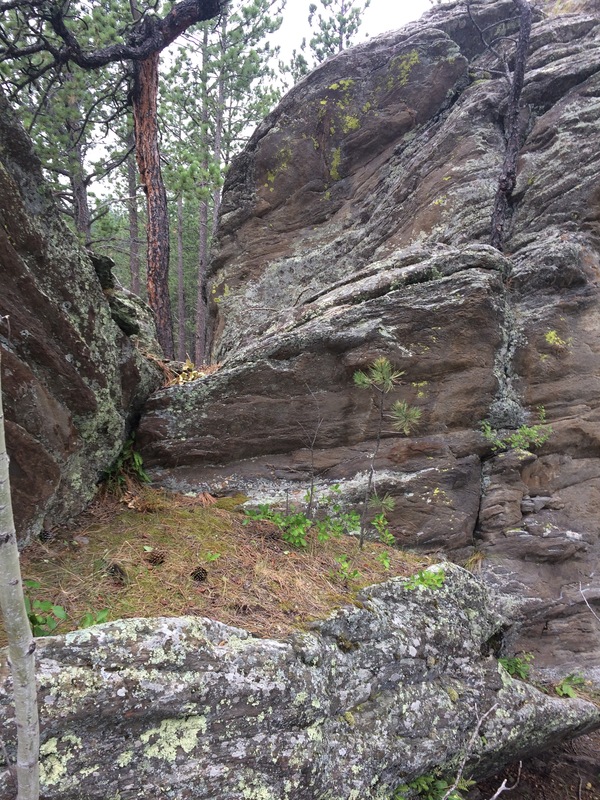 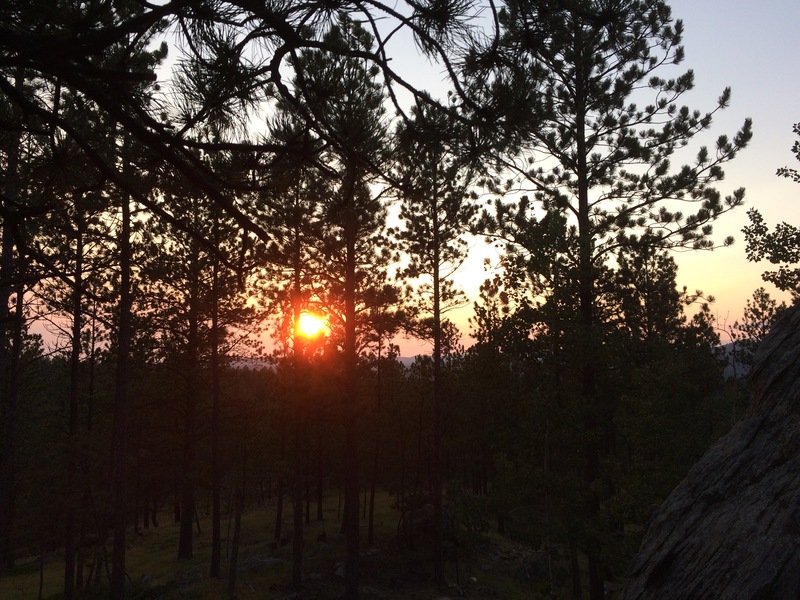 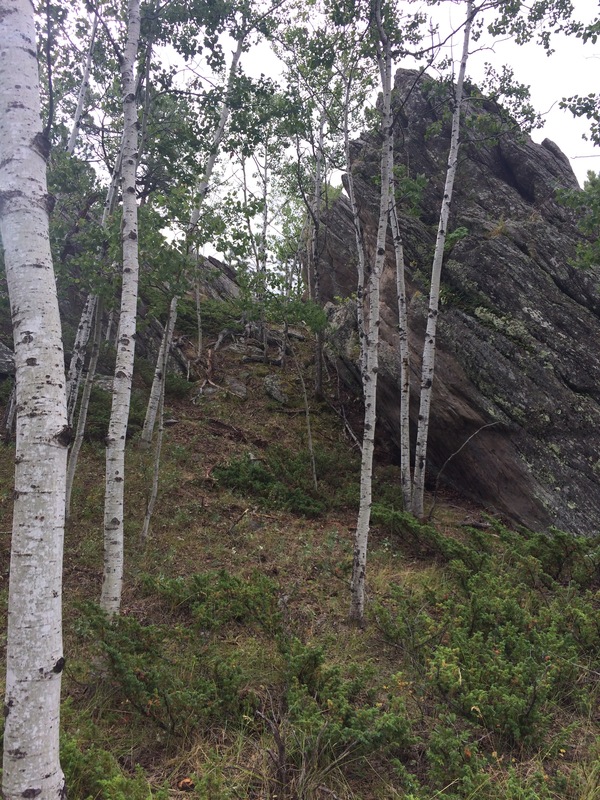 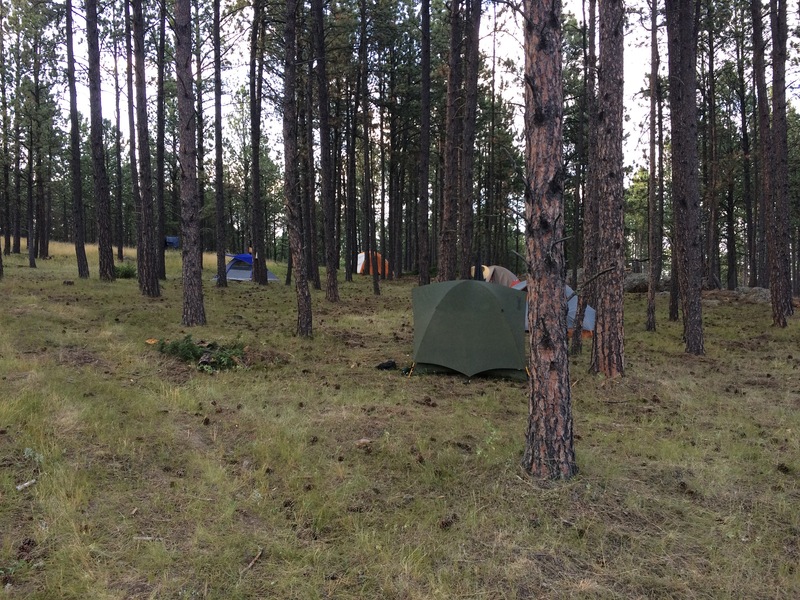 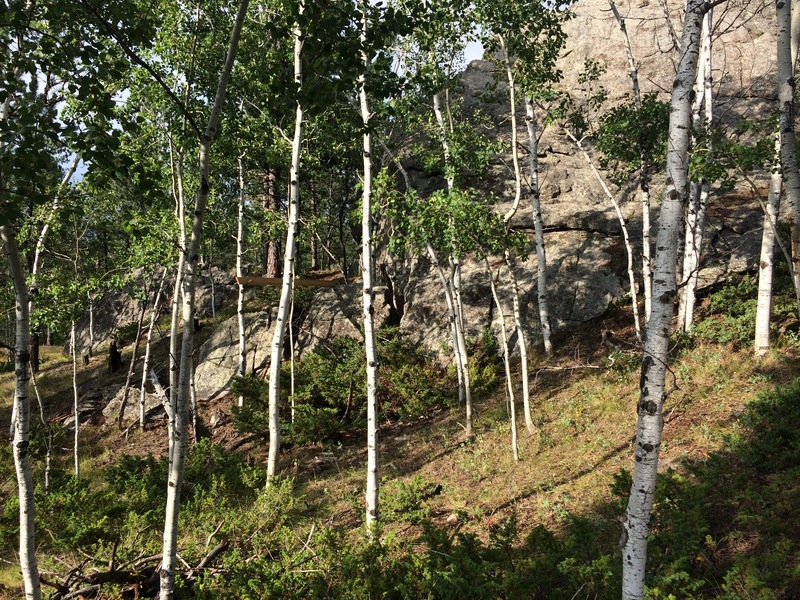 Scrambling on the rocks, I realized that there were a few different view ranges – one, below the canopy, through the valley – two, in the canopy of aspen and ponderosa pines, and three, above the canopy to the distant Black Hills. 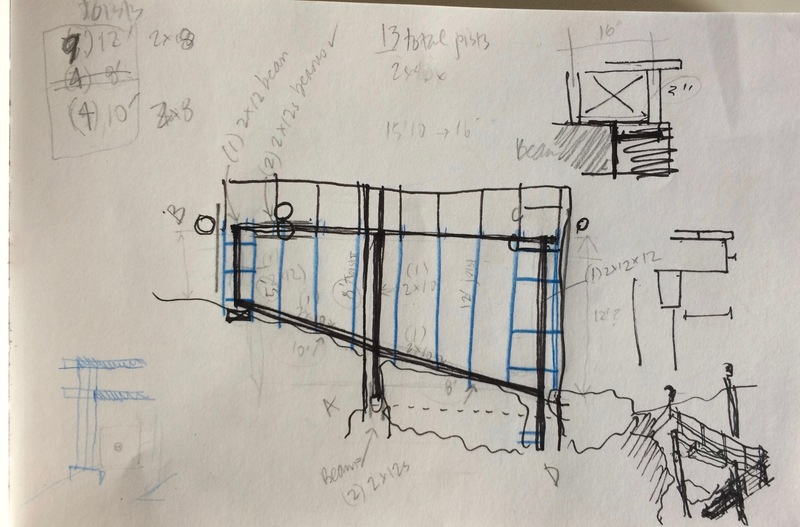 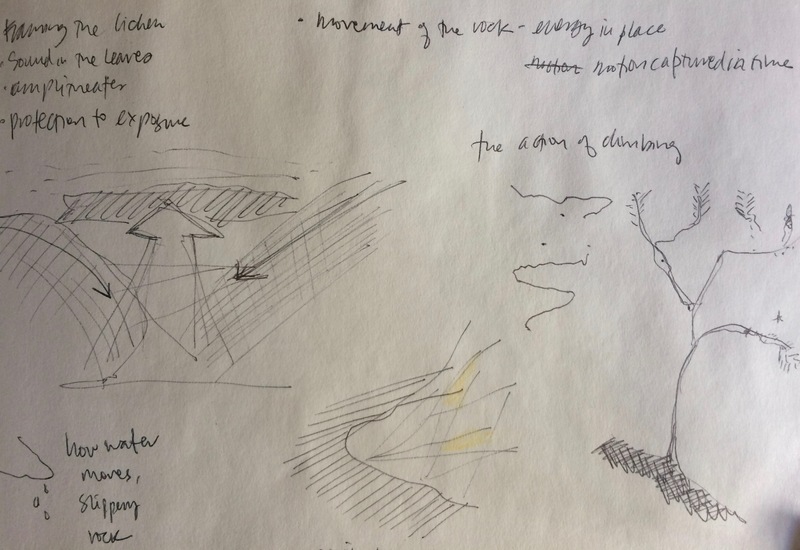 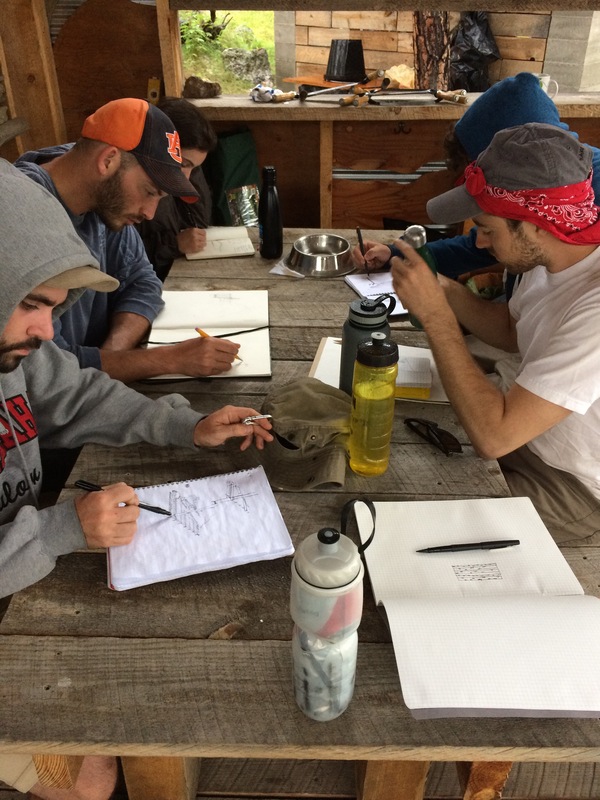 Here are a few sketches thinking through initial concepts (shelter vs exposure, seeing above and below the canopy, framing views), key drawings that we based our lumber counts on and figured out structural components. 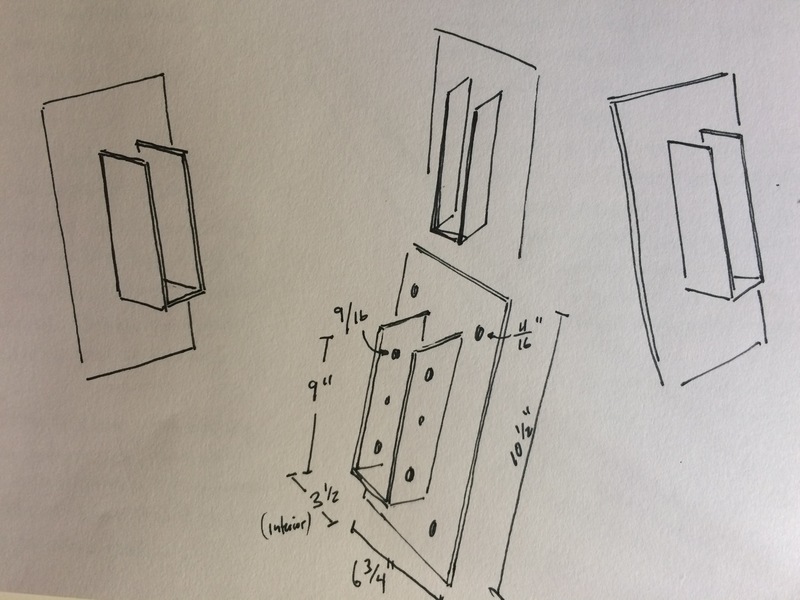 Also included is the custom bracket detail (Drawn by Charley Umbarger). 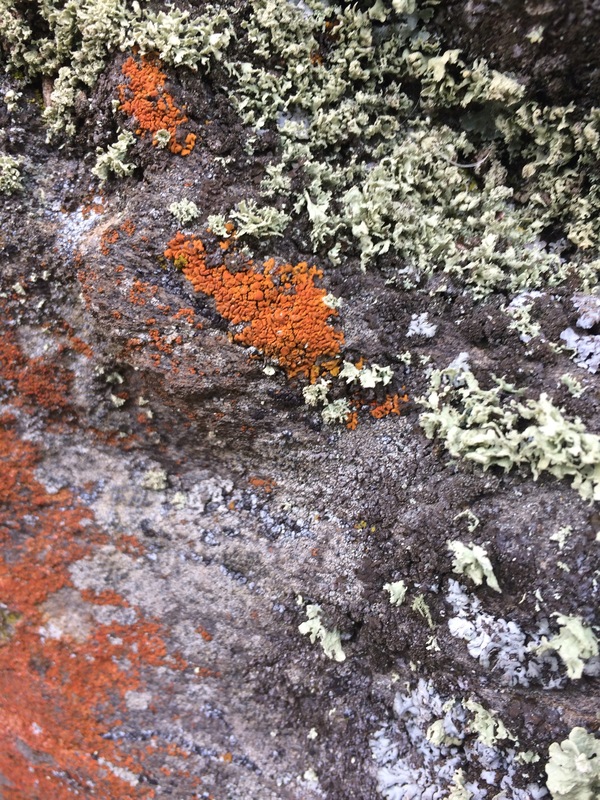 It’s one thing to focus on the view and the big picture, and another to pay attention to the smaller details like the lichen thriving here. 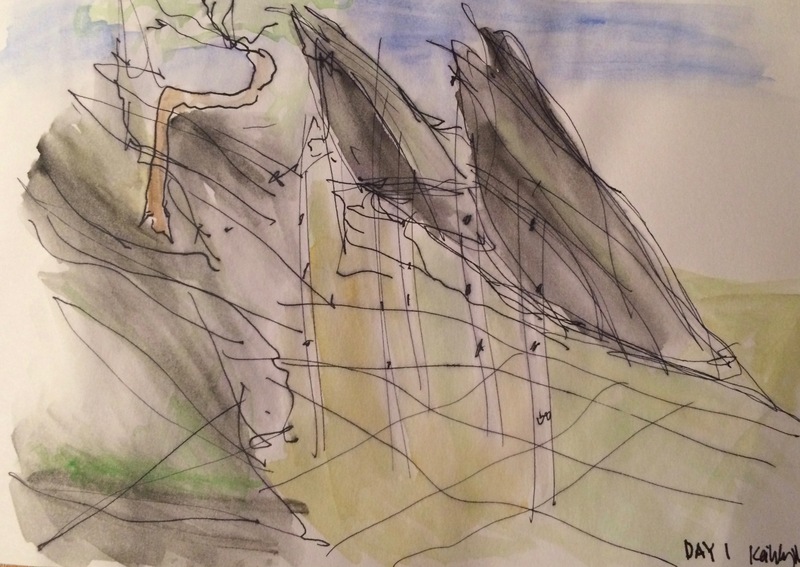 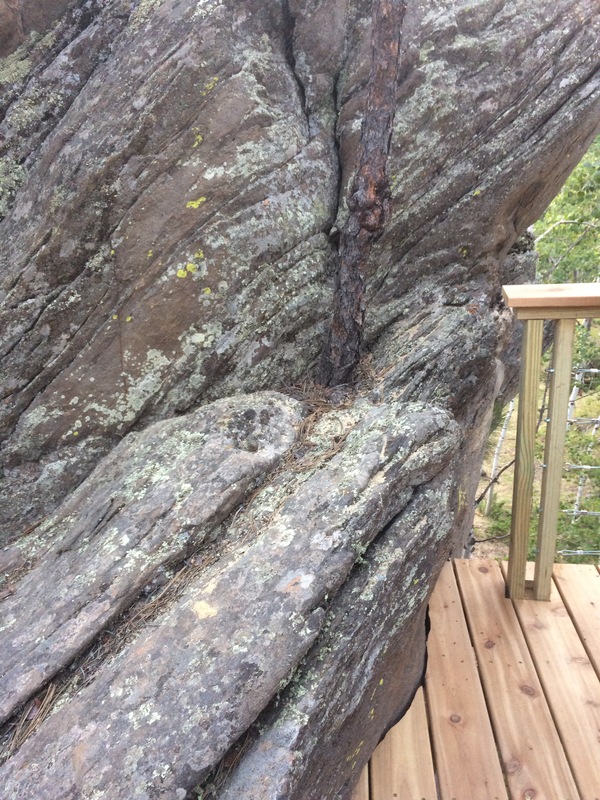 Zooming in, one notices the brave trees growing through slender cracks in the rock. 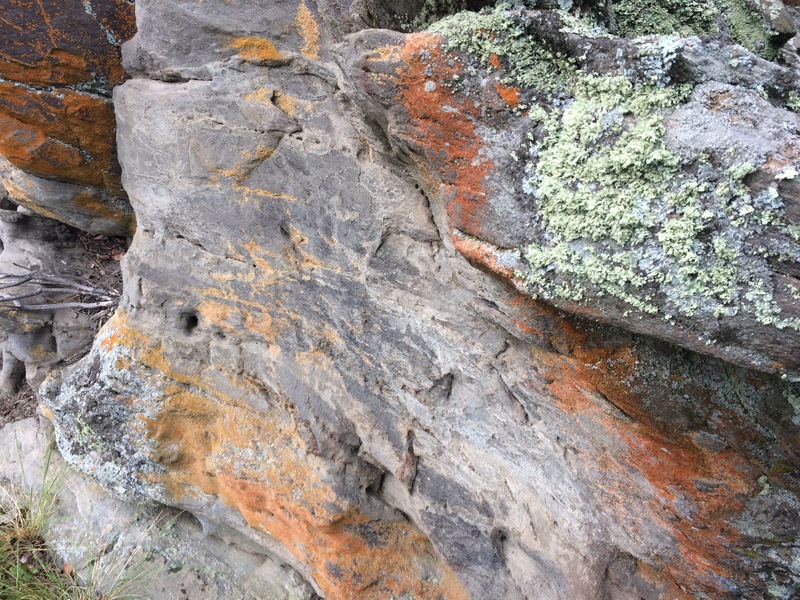 Four different kinds of lichens and their vibrant colors are specifically sited on different rock faces. 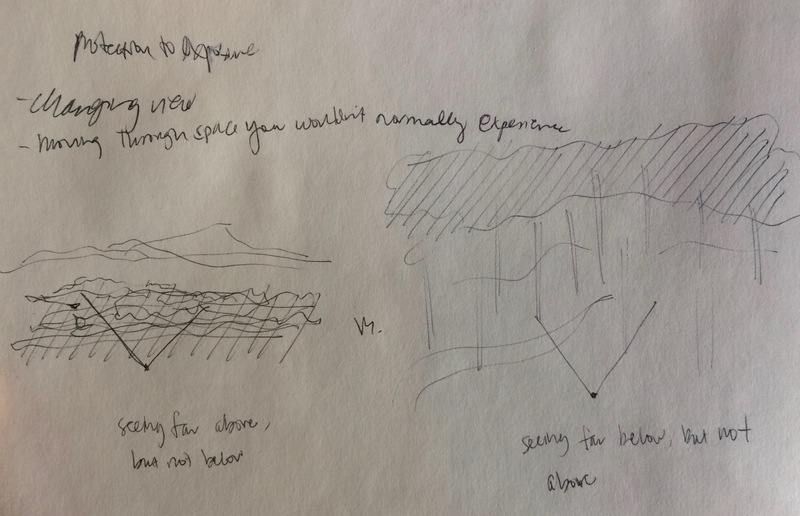 Shadows are constantly shifting across the varied surfaces. 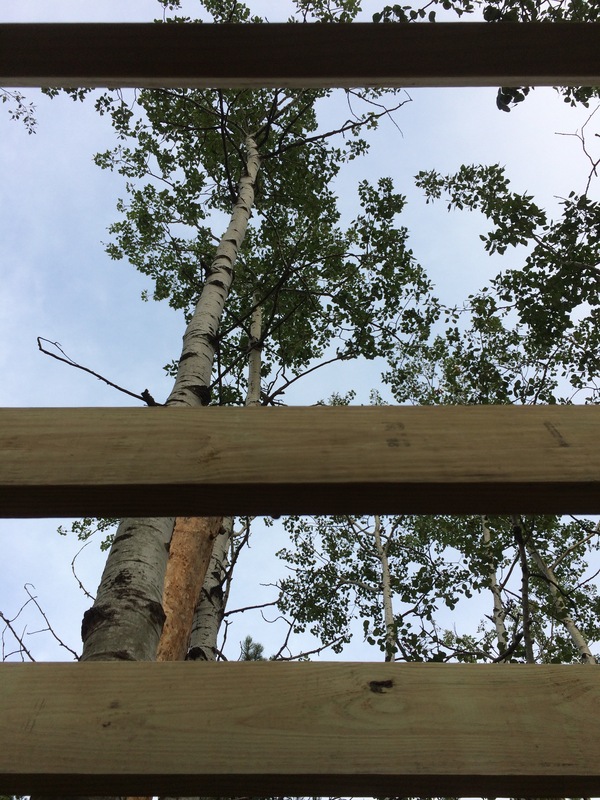 Trees sway in the breeze, cueing a vertigo feeling if you happen to be leaning on one while standing on the newly leveled surface. 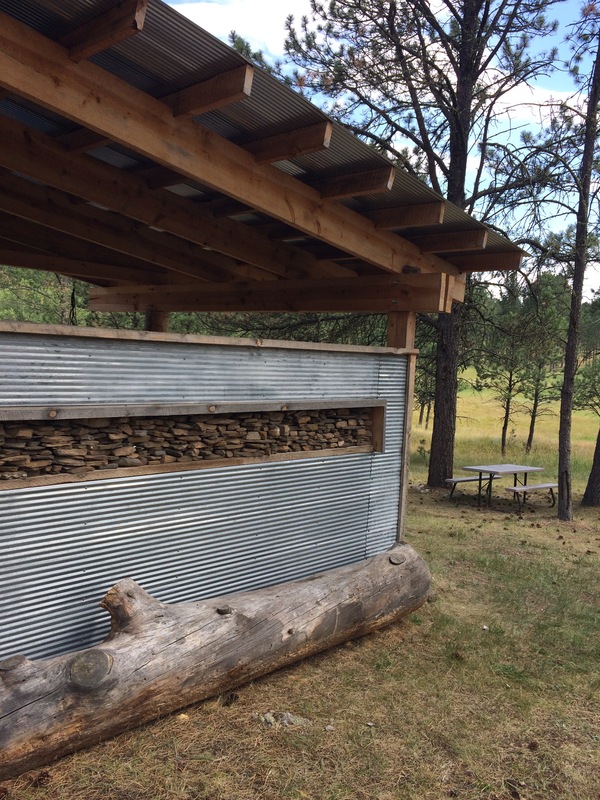 We decided not to build on the very top because anything we build would do little to enhance what is already there. 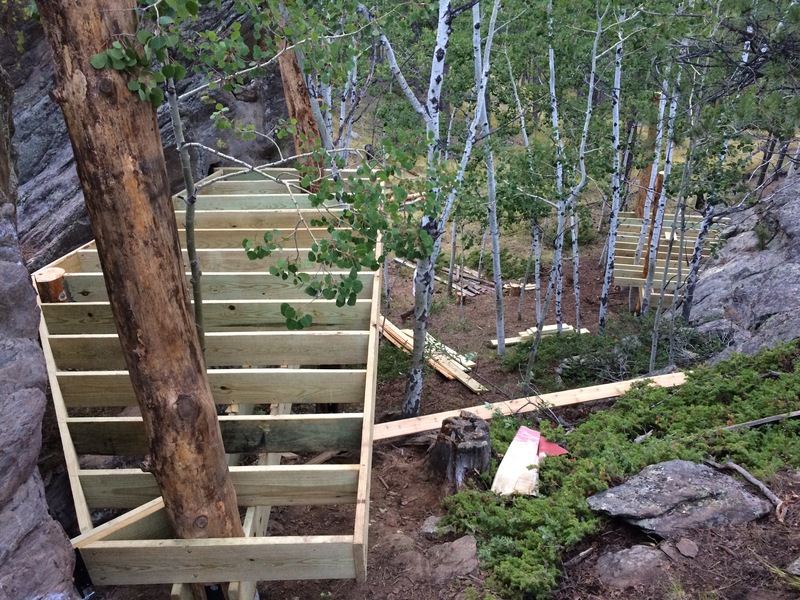 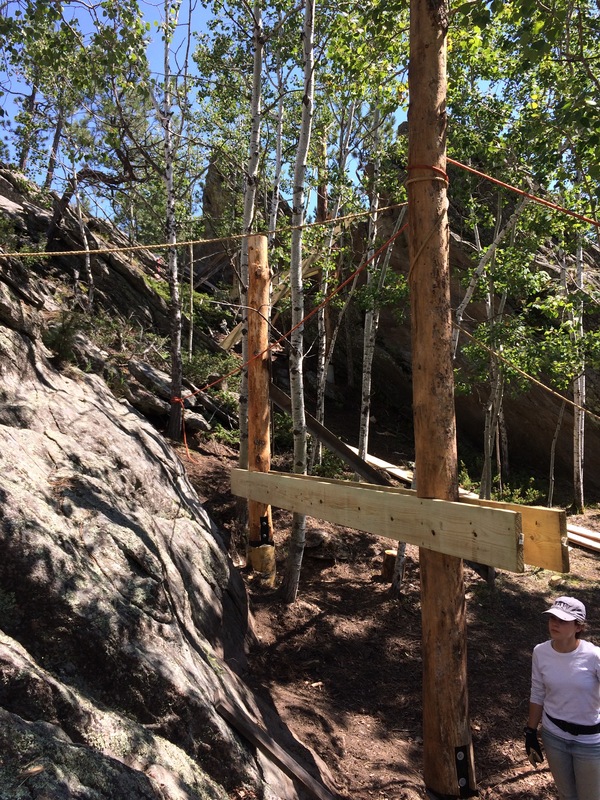 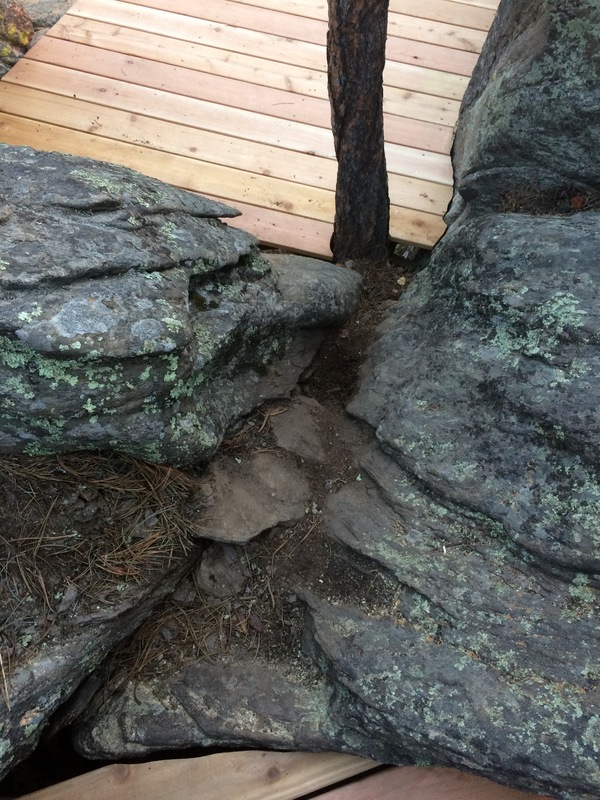 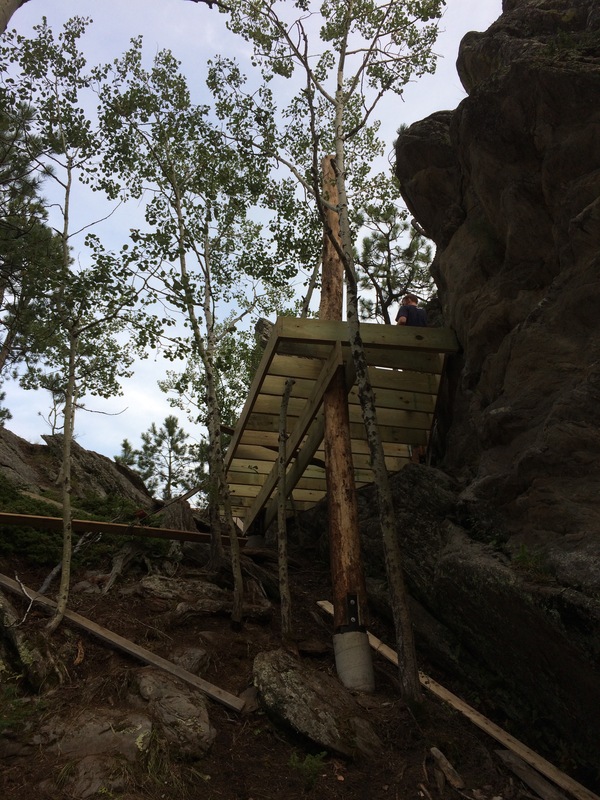 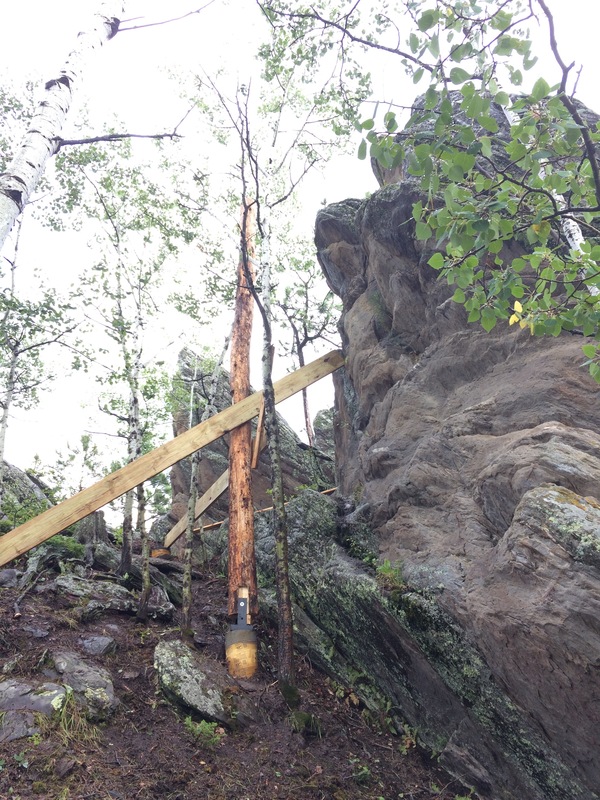 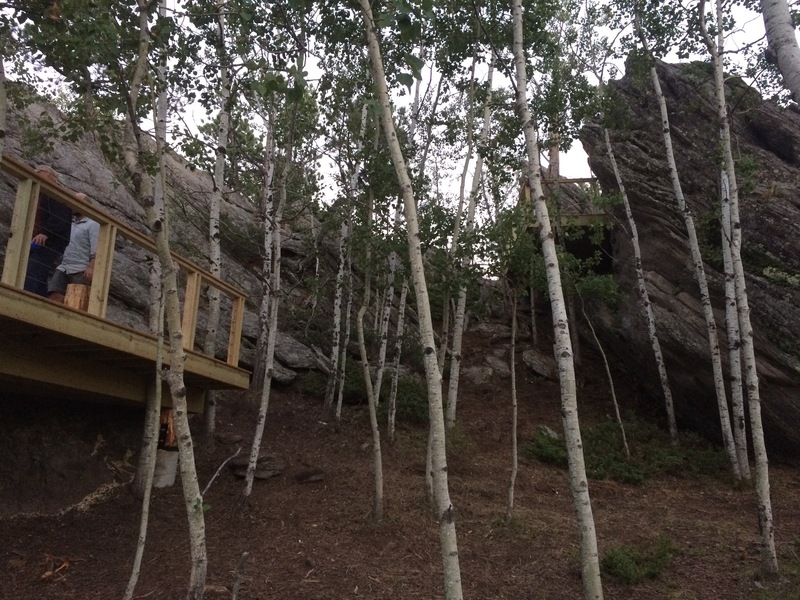 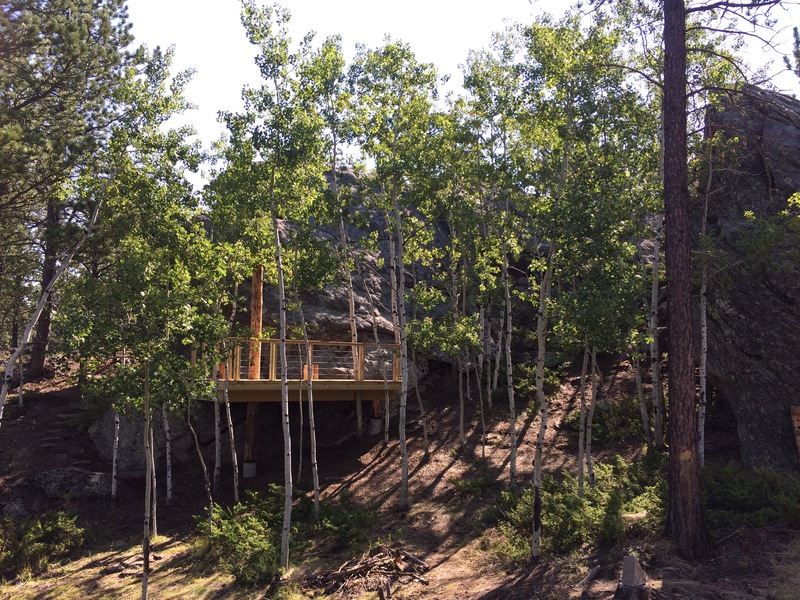 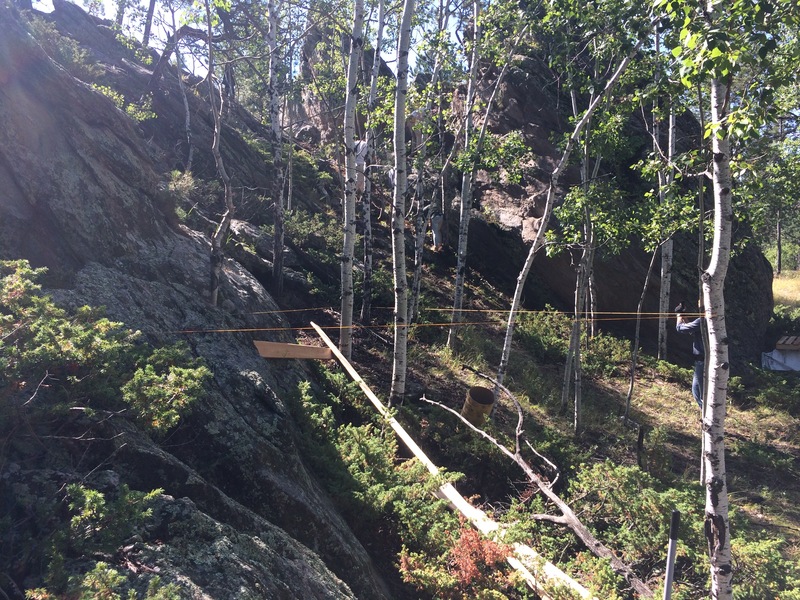 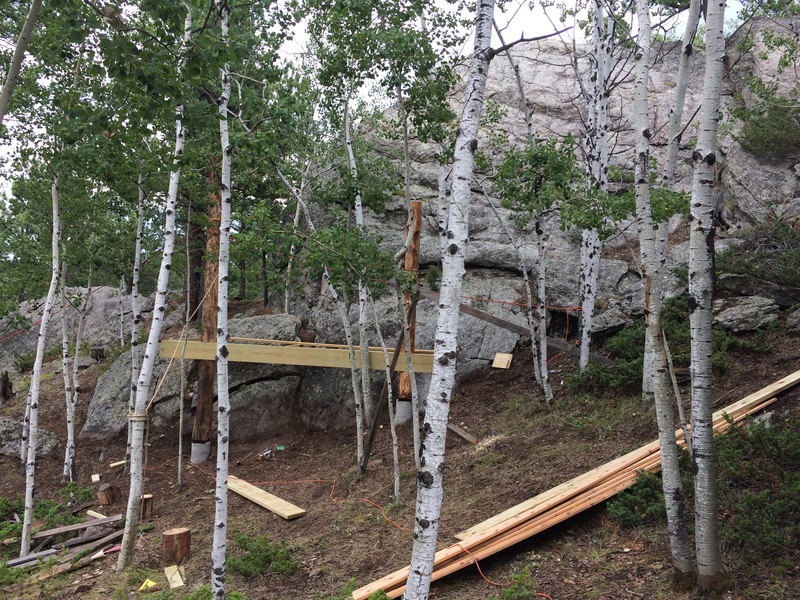 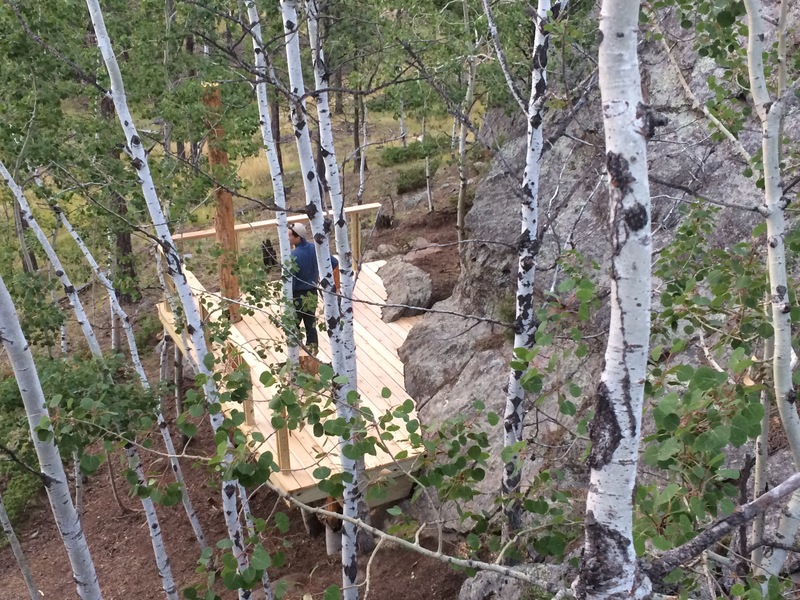 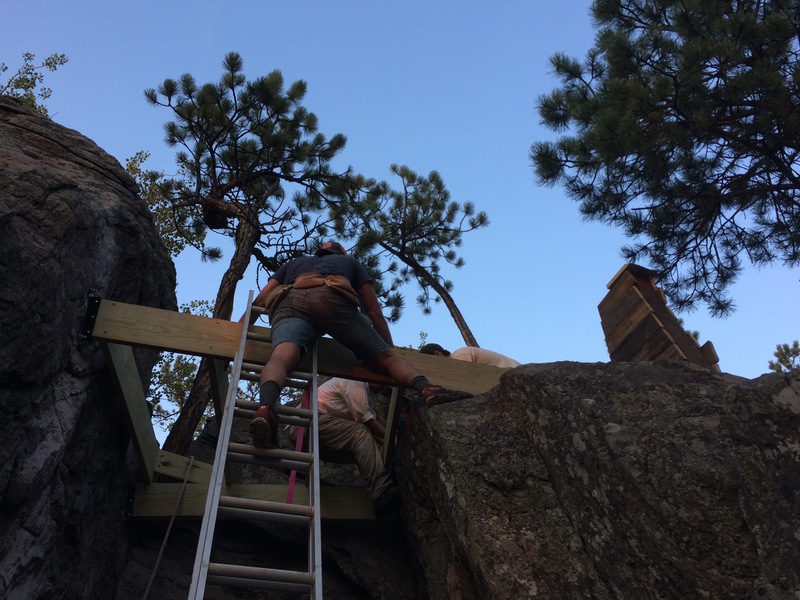 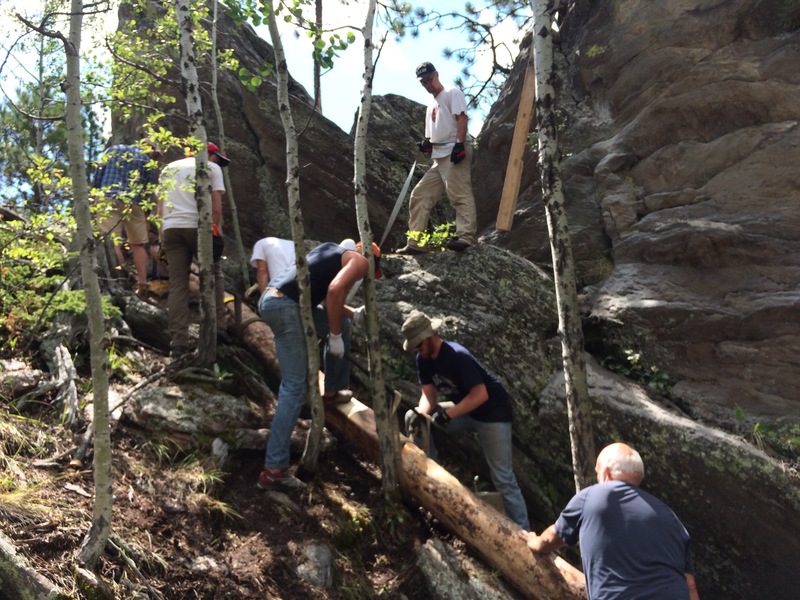 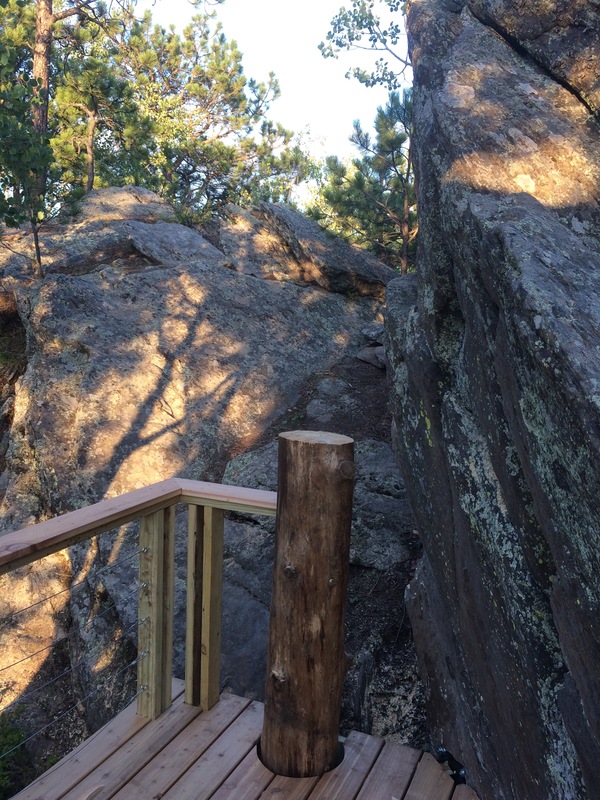 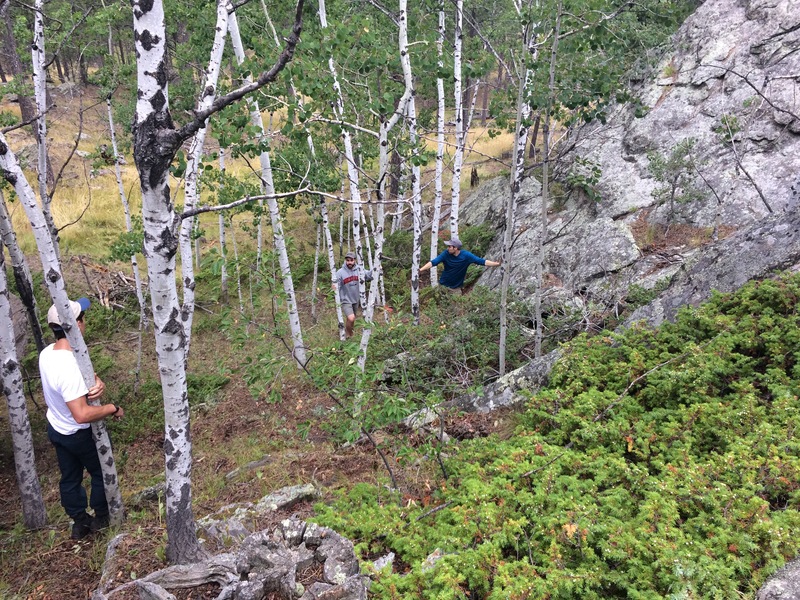 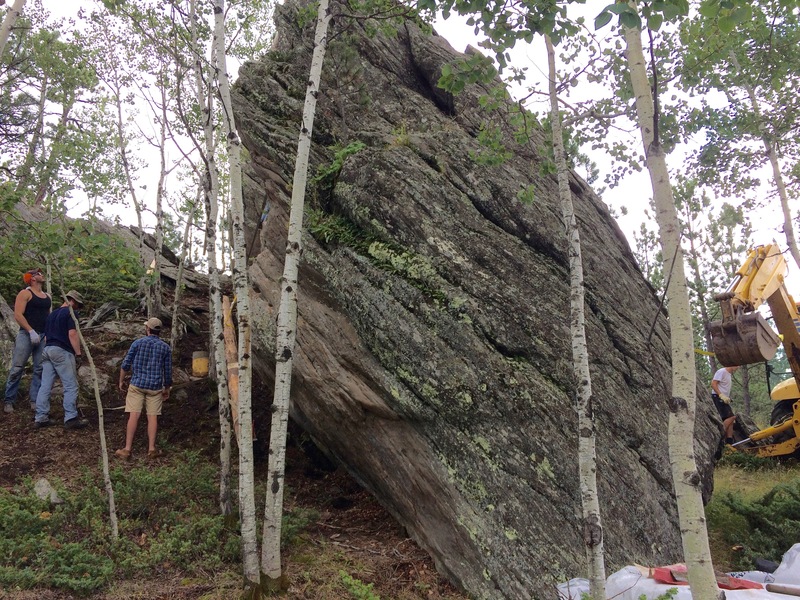 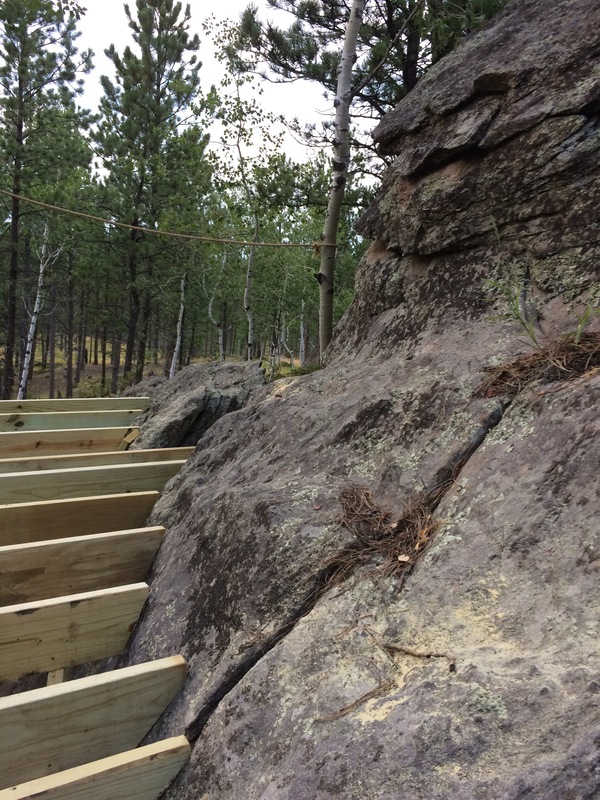 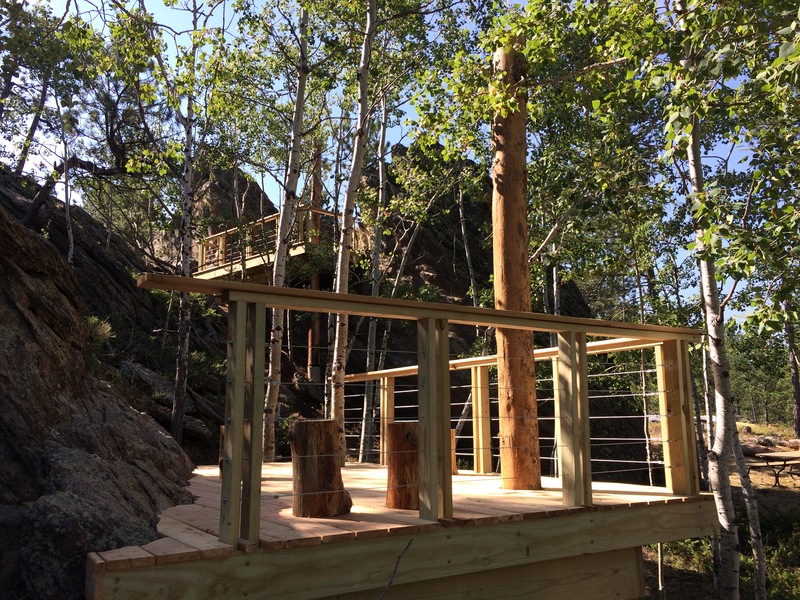 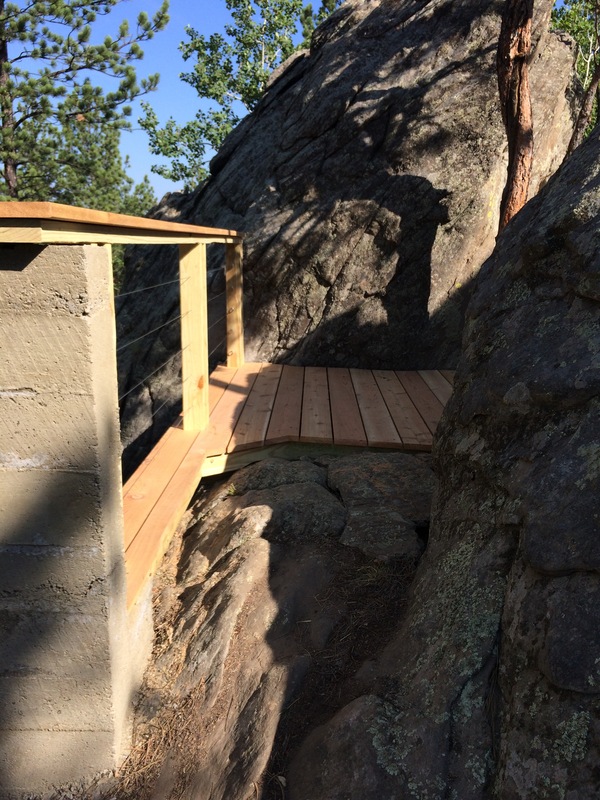 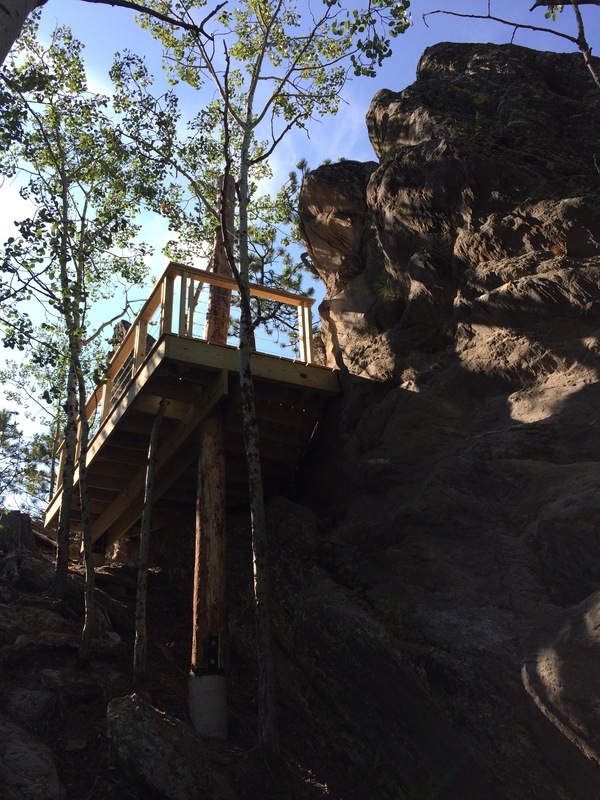 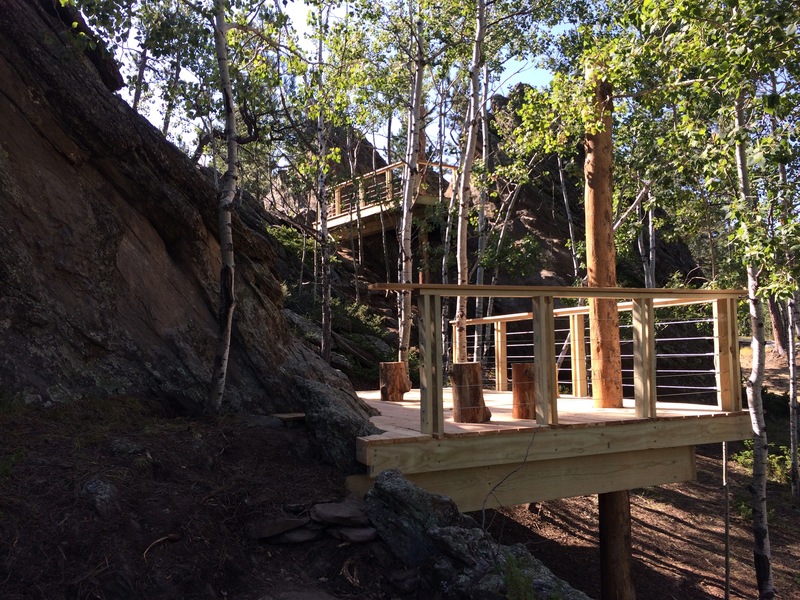 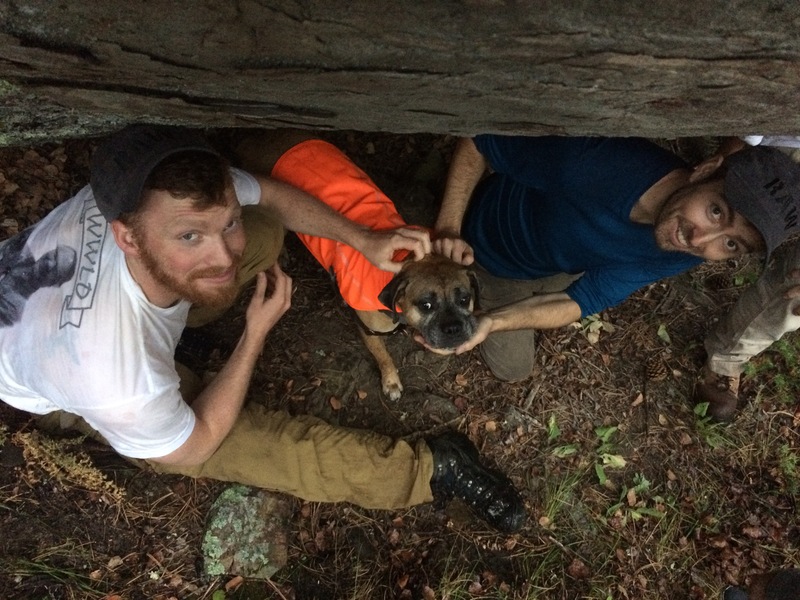 We chose a high rocky gap with a natural and easy to access slope up one side and a lower, corner-wrapping spot that will tie into a future campsite and provide adventurers a platform for rock sitting and scrambling up to a higher view. 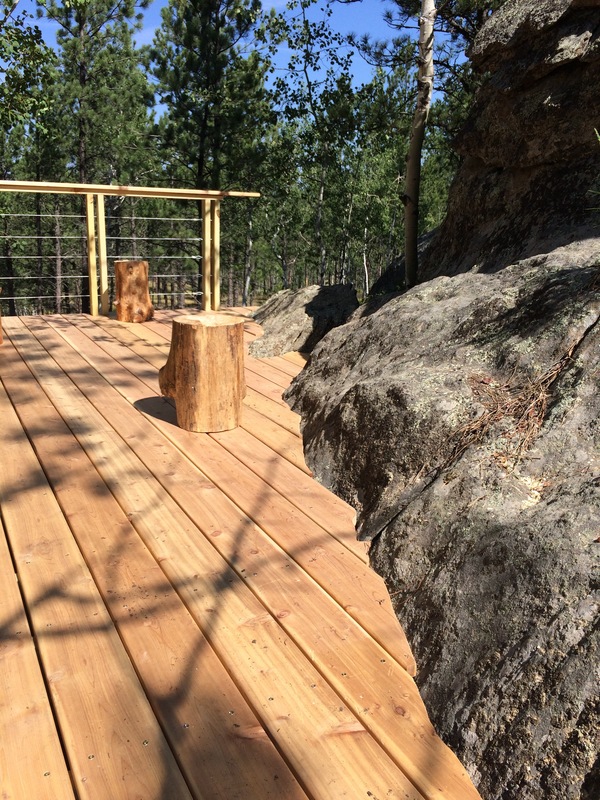 Each platform gives visitors a new experience that they would not have gotten the chance to experience otherwise. 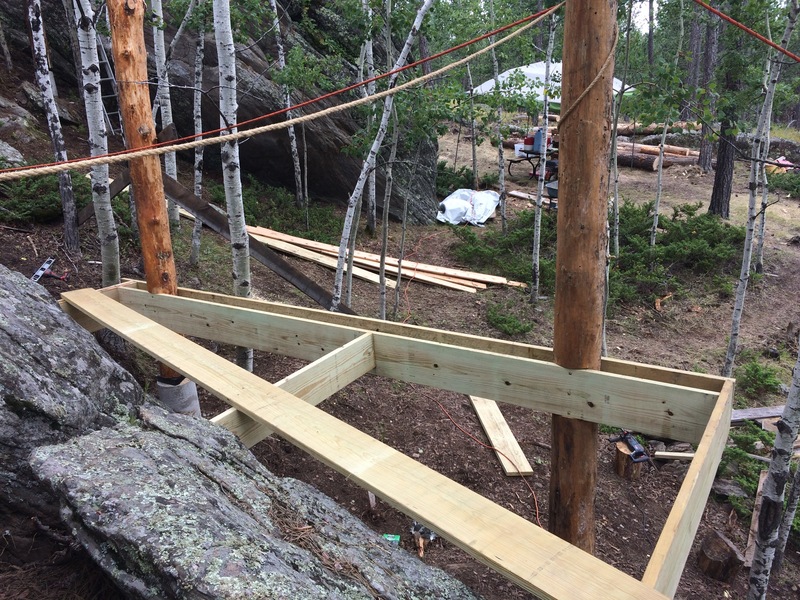 Here are photos from the first 3 days – actually using our shelters built in 2011, exploring the site and zooming into our locations, finding the floor height, locating columns, chiseling columns, pouring footings. 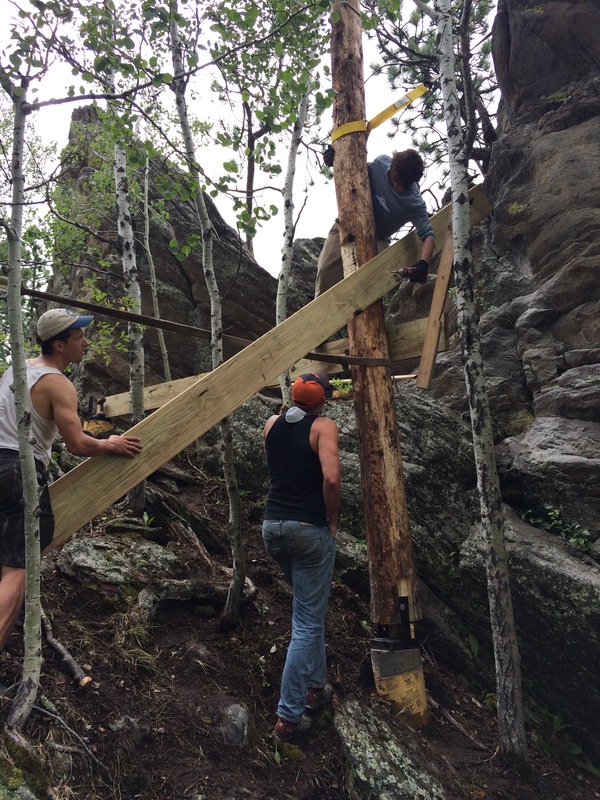 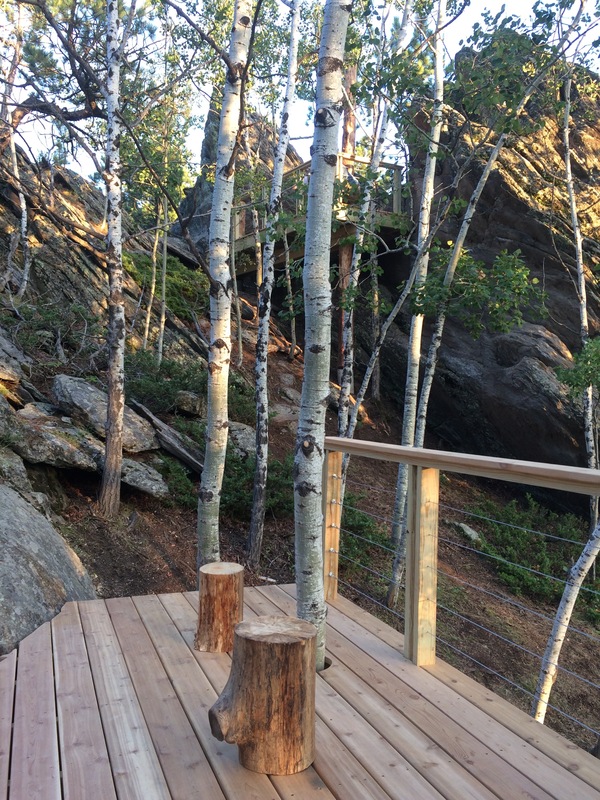 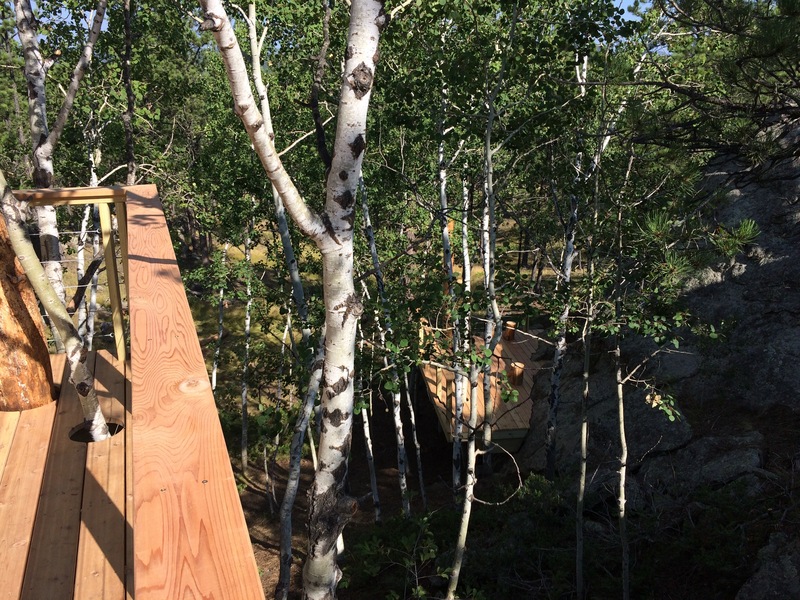 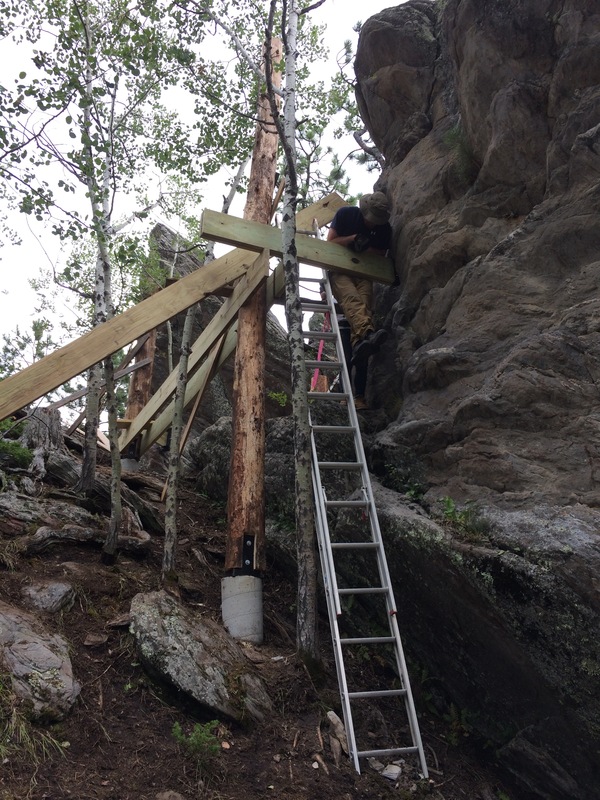 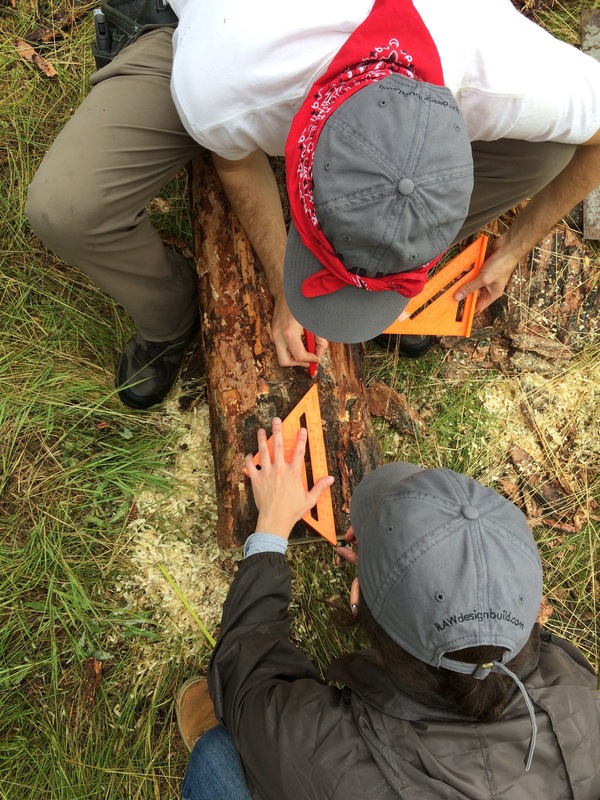 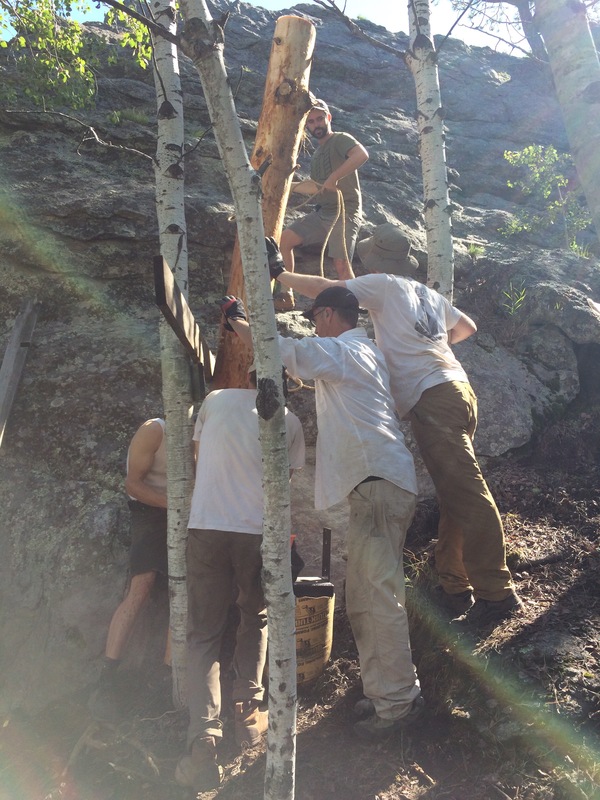 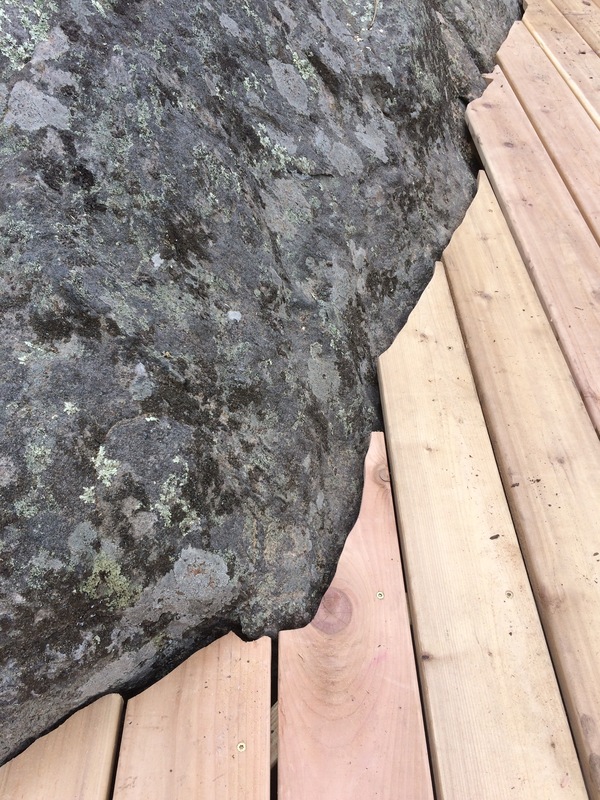 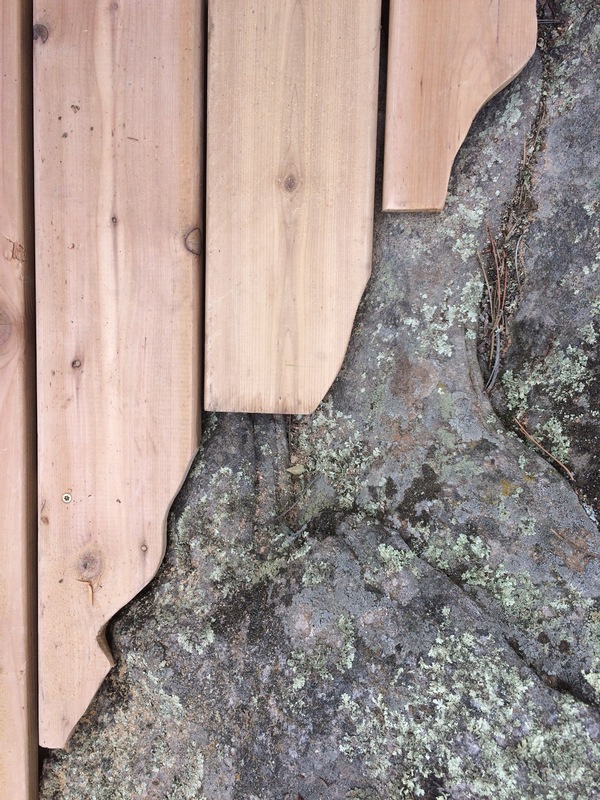 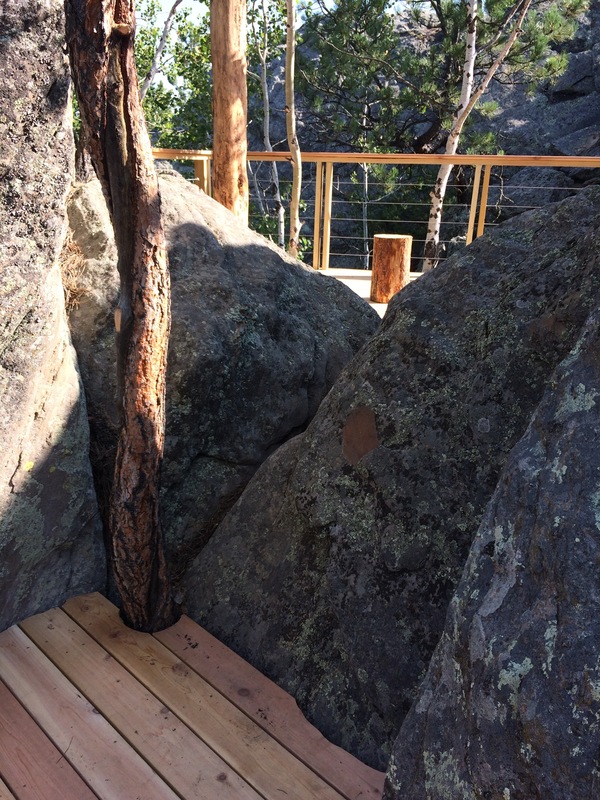 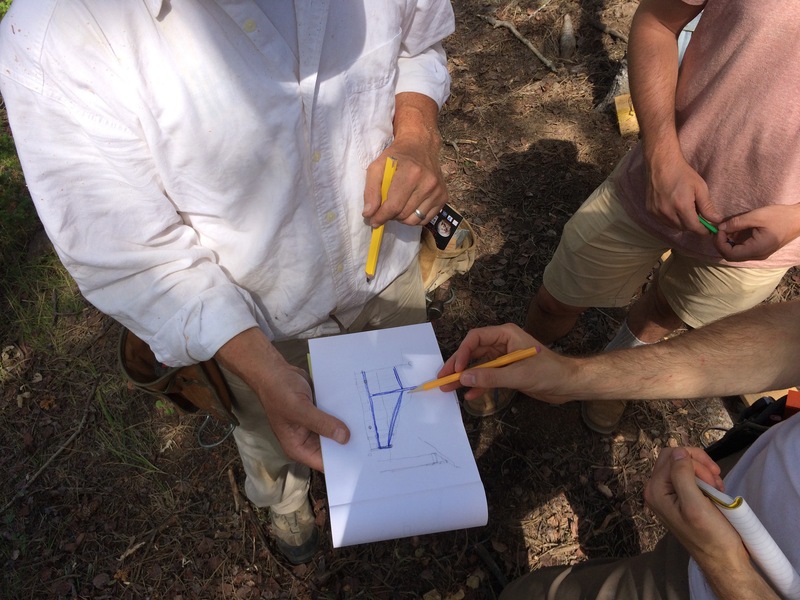 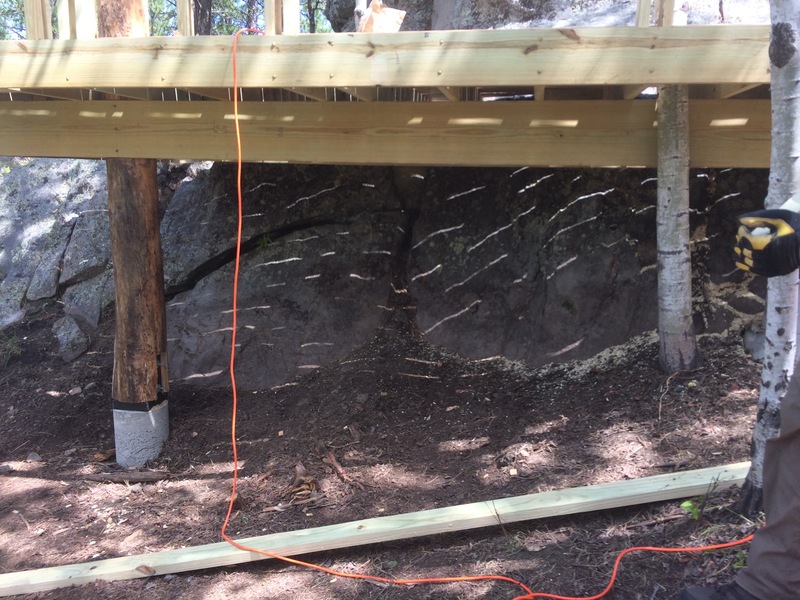 We had locals make custom brackets for our tree columns and the rock-to-beam interface. 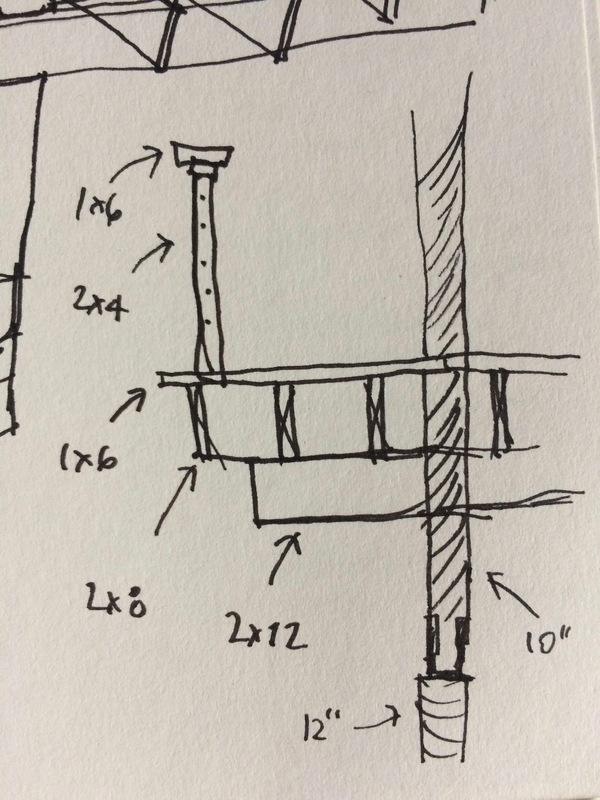 This next series shows the tree columns going vertical (ironic that they were once vertical and now it takes so much energy to get them vertical once again?) 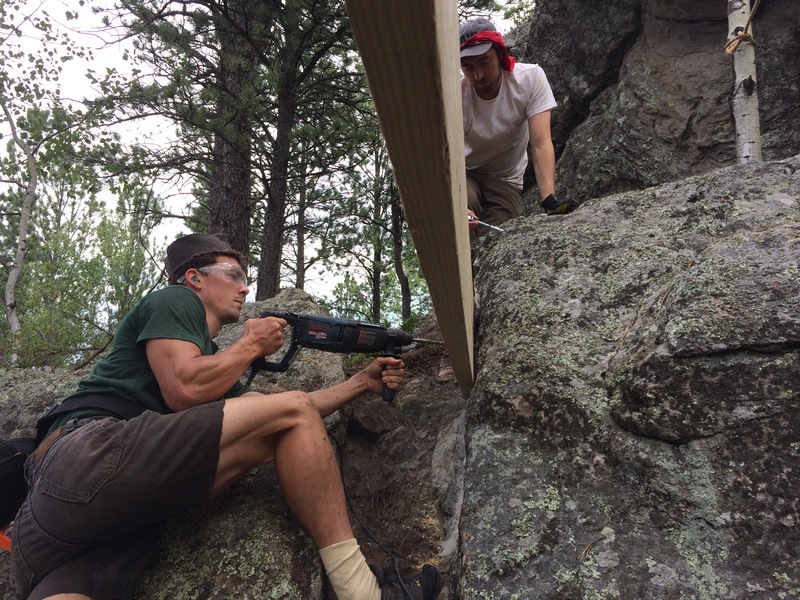 We couldn’t have done it without Andy’s help on his various pieces of machinery and extra tools. 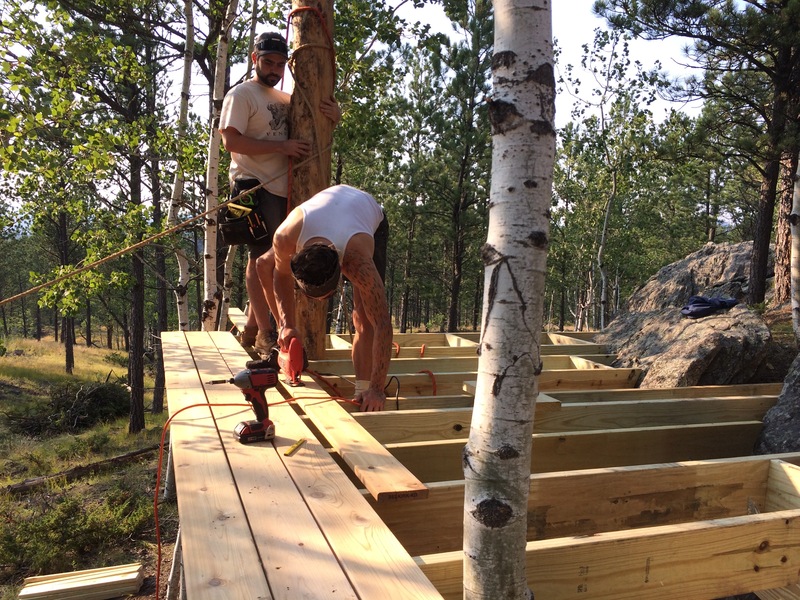 Beams and joists going in, and the space starts to form. 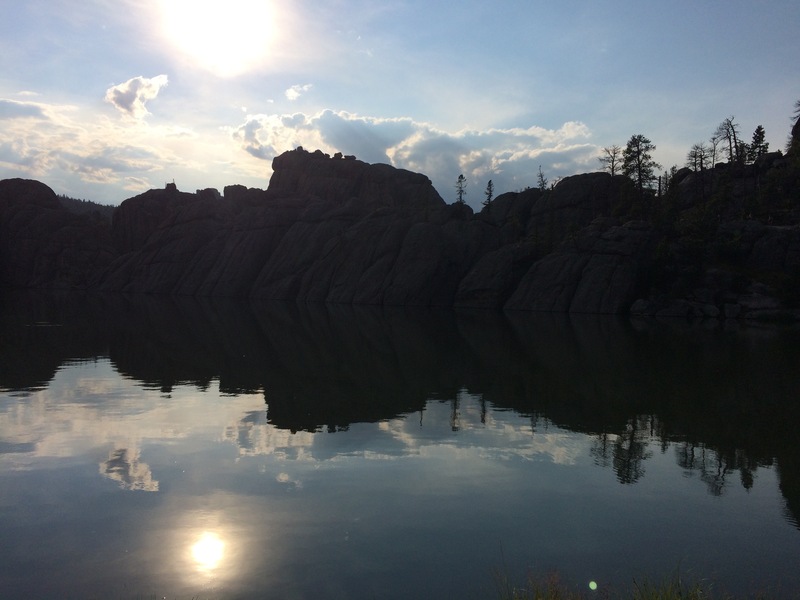 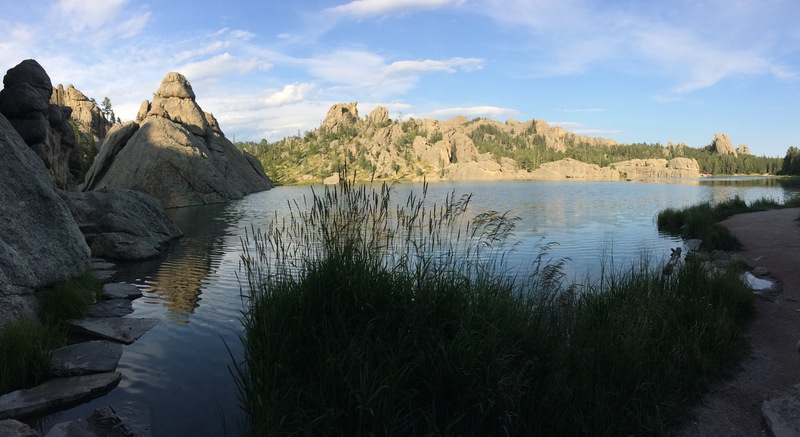 We take a break and go to Sylvan Lake in Custer State Park. 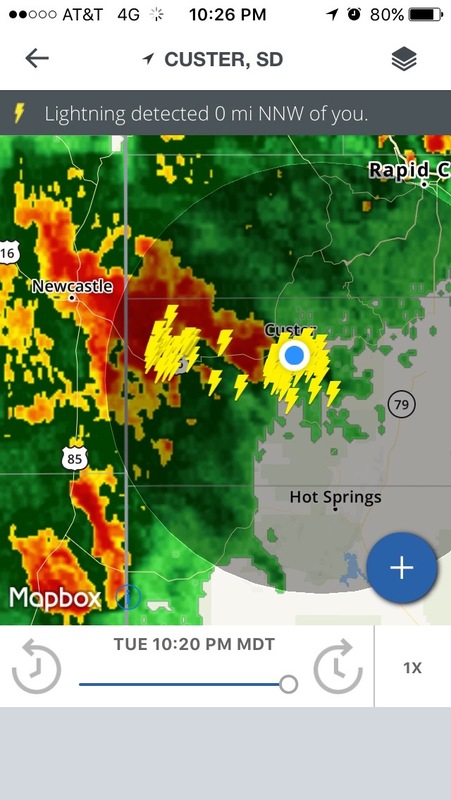 All this weaving between thunderstorms. 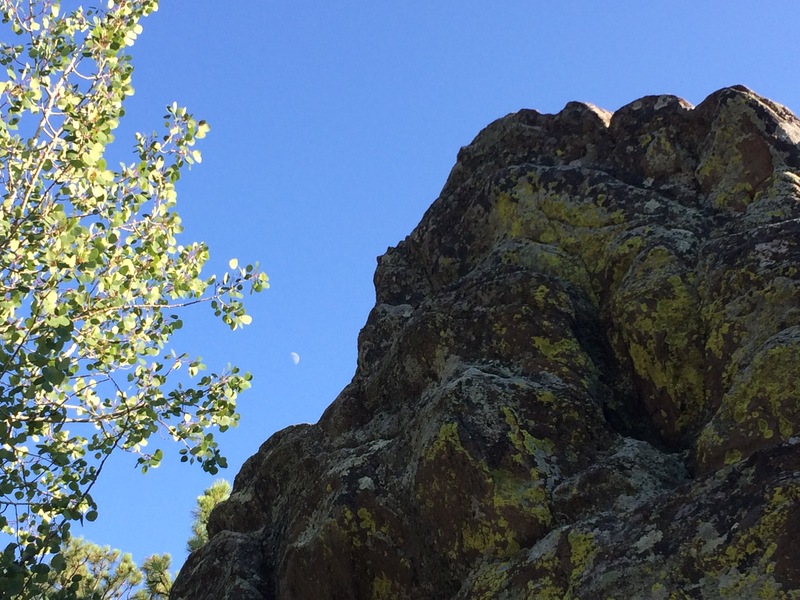 Time is our most challenging constraint (though nature is not far behind!) 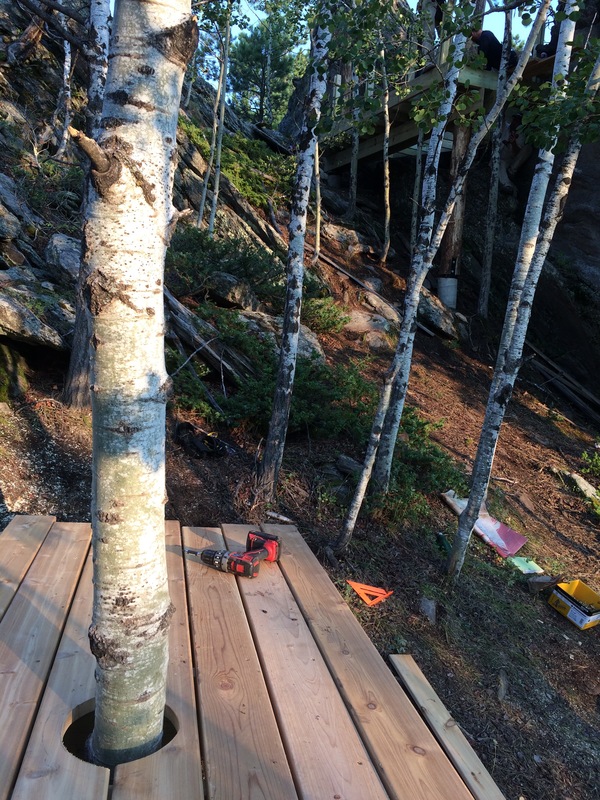 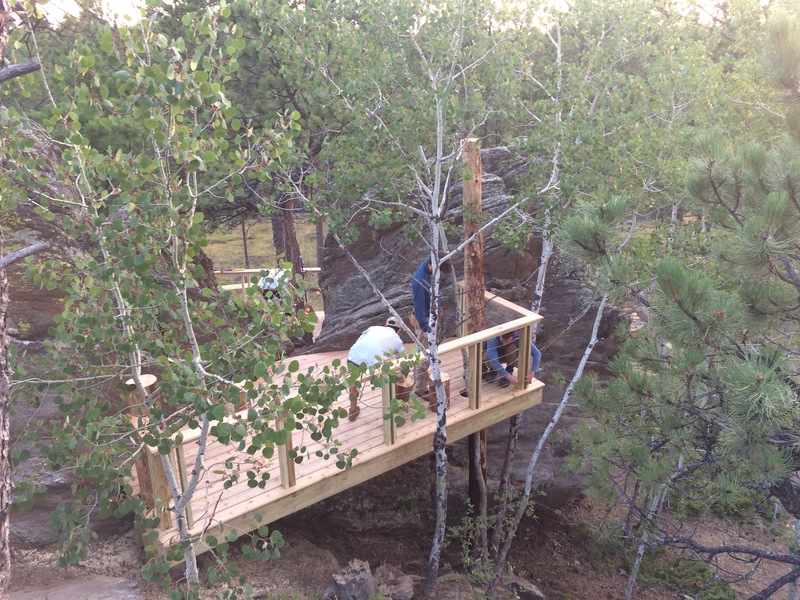 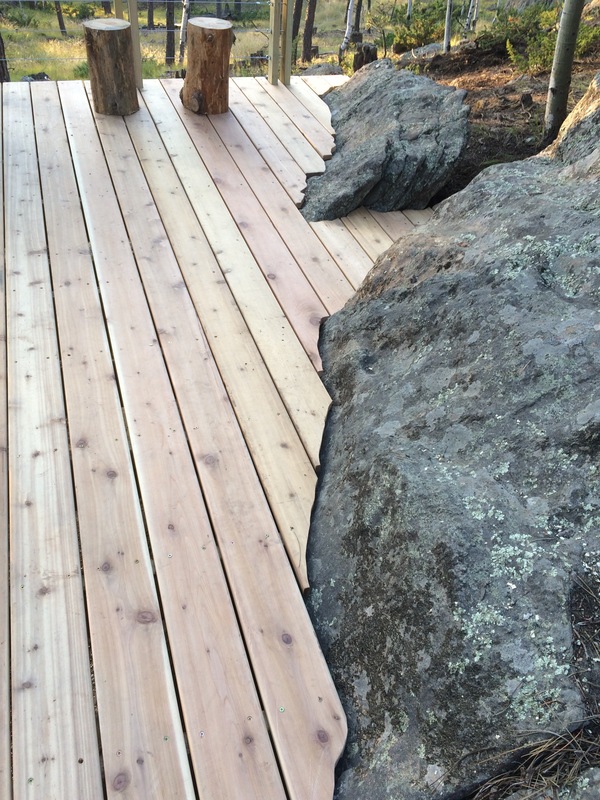 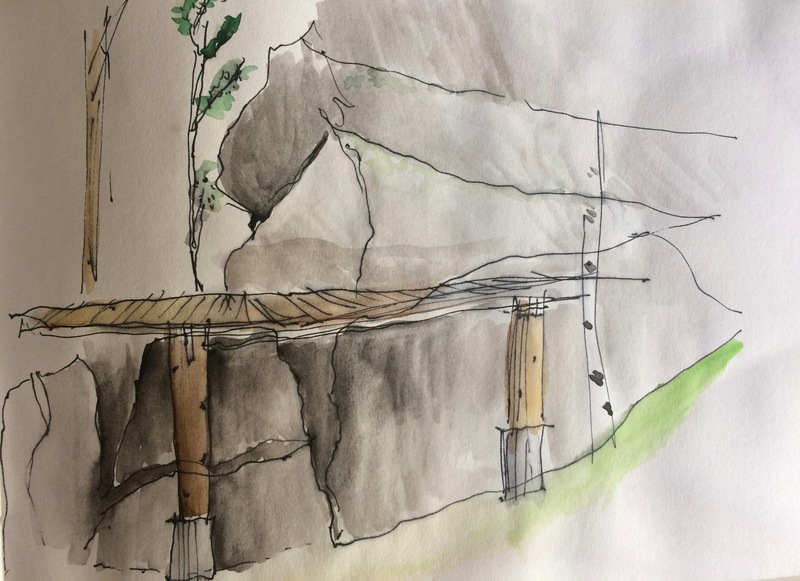 and we push on to get the finishing touches of the rim boards, scribing the rock for the decking (my personal favorite), railing design and decide how to treat the columns. 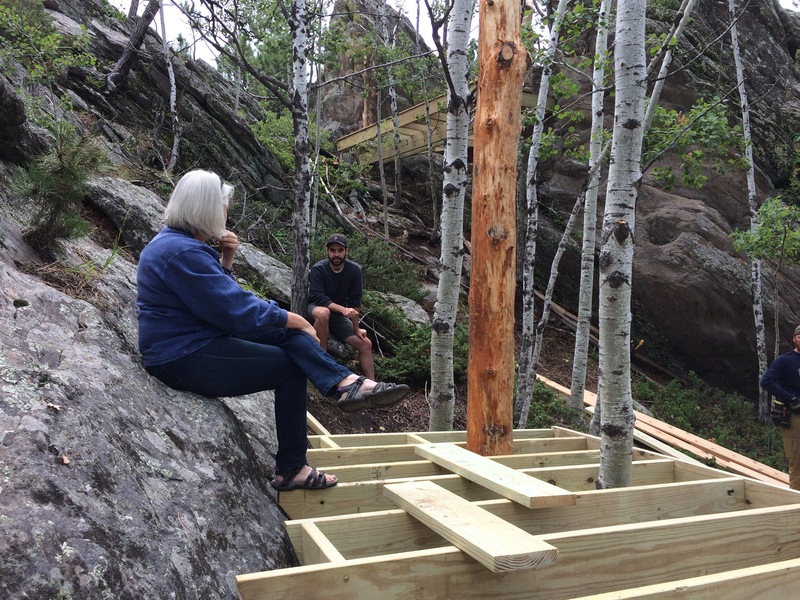 We run out of time for benches. 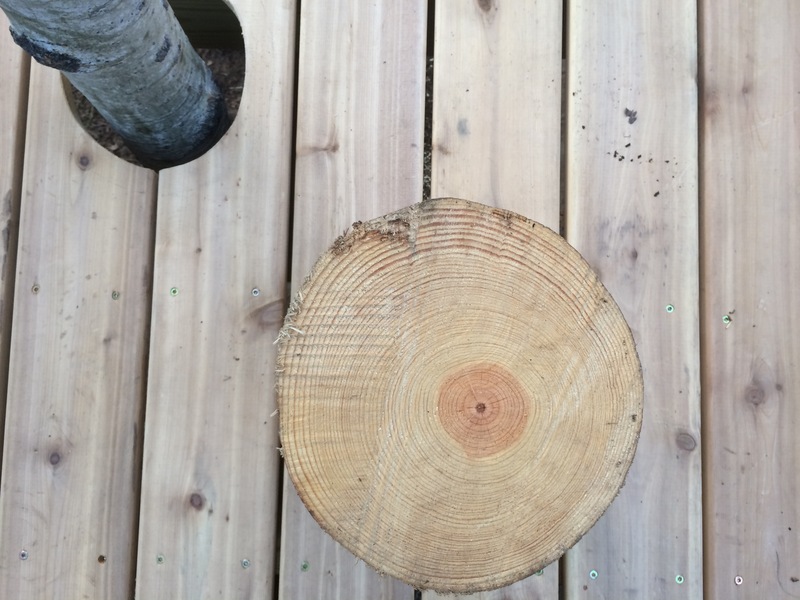 That could be a whole RAW assignment in itself. 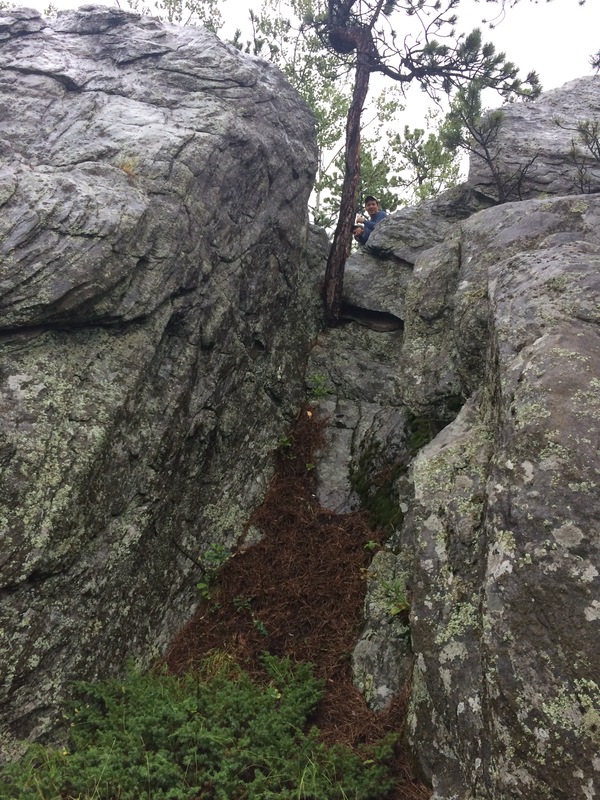 See below for the final shots! 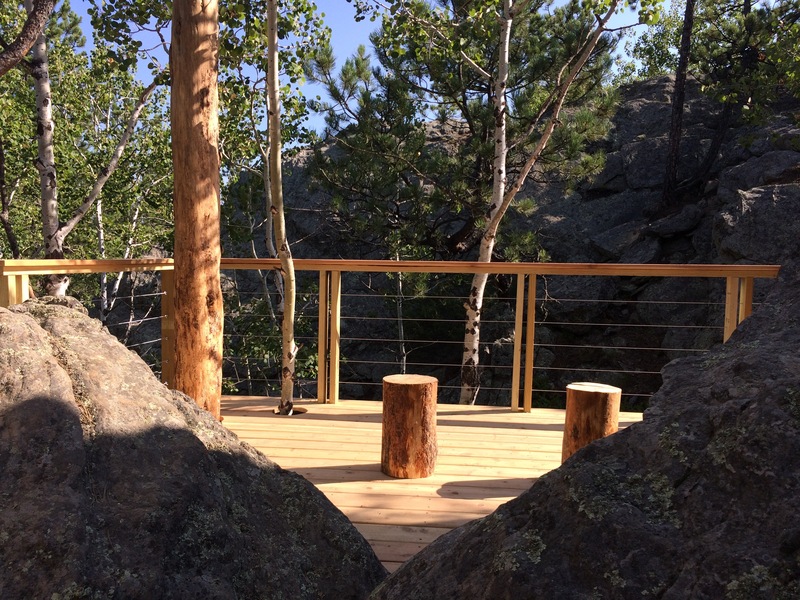 I’m looking forward to going back soon to enjoy the space we’ve created! 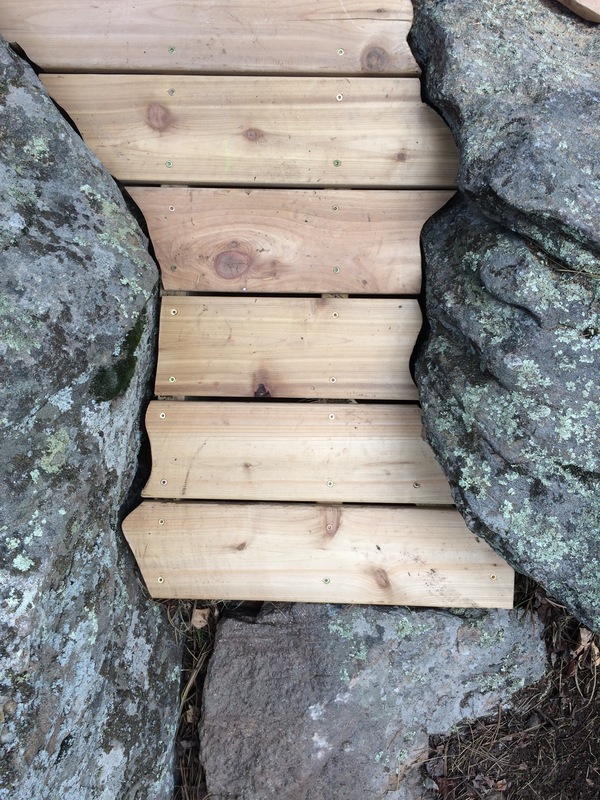 This entry was posted on	August 6, 2017 at 9:55 am	and is filed under Architecture, Beautiful things, Design, Design/Build, handmade.